This article is about the country. For other uses, see Wales (disambiguation). Anthem: "Hen Wlad Fy Nhadau"
Wales (Welsh: Cymru [ˈkəmri] ( listen)) is a country that is part of the United Kingdom and the island of Great Britain. It is bordered by England to the east, the Irish Sea to the north and west, and the Bristol Channel to the south. It had a population in 2011 of 3,063,456 and has a total area of 20,779 km2 (8,023 sq mi). Wales has over 1,680 miles (2,700 km) of coastline and is largely mountainous, with its higher peaks in the north and central areas, including Snowdon (Yr Wyddfa), its highest summit. The country lies within the north temperate zone and has a changeable, maritime climate. Welsh national identity emerged among the Britons after the Roman withdrawal from Britain in the 5th century, and Wales is regarded as one of the modern Celtic nations. Llywelyn ap Gruffudd's death in 1282 marked the completion of Edward I of England's conquest of Wales, though Owain Glyndŵr briefly restored independence to Wales in the early 15th century. The whole of Wales was annexed by England and incorporated within the English legal system under the Laws in Wales Acts 1535 and 1542. Distinctive Welsh politics developed in the 19th century. Welsh liberalism, exemplified in the early 20th century by Lloyd George, was displaced by the growth of socialism and the Labour Party. Welsh national feeling grew over the century; Plaid Cymru was formed in 1925 and the Welsh Language Society in 1962. Established under the Government of Wales Act 1998, the National Assembly for Wales holds responsibility for a range of devolved policy matters. At the dawn of the Industrial Revolution, development of the mining and metallurgical industries transformed the country from an agricultural society into an industrial nation; the South Wales Coalfield's exploitation caused a rapid expansion of Wales' population. Two-thirds of the population live in South Wales, including Cardiff, Swansea, Newport and the nearby valleys. Now that the country's traditional extractive and heavy industries have gone or are in decline, Wales' economy depends on the public sector, light and service industries and tourism. Although Wales closely shares its political and social history with the rest of Great Britain, and a majority of the population in most areas speaks English as a first language, the country has retained a distinct cultural identity and is officially bilingual. Over 560,000 Welsh language speakers live in Wales, and the language is spoken by a majority of the population in parts of the north and west. From the late 19th century onwards, Wales acquired its popular image as the "land of song", in part due to the eisteddfod tradition. At many international sporting events, such as the FIFA World Cup, Rugby World Cup and the Commonwealth Games, Wales has its own national teams, though at the Olympic Games, Welsh athletes compete as part of a Great Britain team. Rugby union is seen as a symbol of Welsh identity and an expression of national consciousness. The English words "Wales" and "Welsh" derive from the same Germanic root (singular Walh, plural Walha), which was itself derived from the name of the Gaulish people known to the Romans as Volcae and which came to refer indiscriminately to all non-Germanic peoples. The Old English-speaking Anglo-Saxons came to use the term Wælisc when referring to the Britons in particular, and Wēalas when referring to their lands. The modern names for some Continental European lands (e.g. Wallonia, Wallachia and Valais) and peoples (e.g. the Vlachs via a borrowing into Old Church Slavonic) have a similar etymology. Historically in Britain, the words were not restricted to modern Wales or to the Welsh but were used to refer to anything that the Anglo-Saxons associated with the Britons, including other non-Germanic territories in Britain (e.g. Cornwall) and places in Anglo-Saxon territory associated with Britons (e.g. Walworth in County Durham and Walton in West Yorkshire). The modern Welsh name for themselves is Cymry, and Cymru is the Welsh name for Wales. These words (both of which are pronounced [ˈkəm.rɨ]) are descended from the Brythonic word combrogi, meaning "fellow-countrymen". The use of the word Cymry as a self-designation derives from the location in the post-Roman Era (after the arrival of the Anglo-Saxons) of the Welsh (Brythonic-speaking) people in modern Wales as well as in northern England and southern Scotland (Yr Hen Ogledd) (English: The Old North). It emphasised that the Welsh in modern Wales and in the Hen Ogledd were one people, different from other peoples. In particular, the term was not applied to the Cornish or the Breton peoples, who are of similar heritage, culture, and language to the Welsh. The word came into use as a self-description probably before the 7th century. It is attested in a praise poem to Cadwallon ap Cadfan (Moliant Cadwallon, by Afan Ferddig) c. 633. In Welsh literature, the word Cymry was used throughout the Middle Ages to describe the Welsh, though the older, more generic term Brythoniaid continued to be used to describe any of the Britonnic peoples (including the Welsh) and was the more common literary term until c. 1200. Thereafter Cymry prevailed as a reference to the Welsh. Until c. 1560 the word was spelt Kymry or Cymry, regardless of whether it referred to the people or their homeland. The Latinised forms of these names, Cambrian, Cambric and Cambria, survive as lesser-used alternative names for Wales, Welsh and the Welsh people. Examples include the Cambrian Mountains (which cover much of Wales and gave their name to the Cambrian geological period), the newspaper Cambrian News, and the organisations Cambrian Airways, Cambrian Railways, Cambrian Archaeological Association and the Royal Cambrian Academy of Art. Outside Wales, a related form survives as the name Cumbria in North West England, which was once a part of Yr Hen Ogledd. The Cumbric language, which is thought to have been closely related to Welsh, was spoken in this area until becoming extinct around the 12th century. This form also appears at times in literary references, as in the pseudohistorical "Historia Regum Britanniae" of Geoffrey of Monmouth, where the character of Camber is described as the eponymous King of Cymru. Wales has been inhabited by modern humans for at least 29,000 years. Continuous human habitation dates from the end of the last ice age, between 12,000 and 10,000 years before present (BP), when Mesolithic hunter-gatherers from central Europe began to migrate to Great Britain. At that time sea levels were much lower than today, and the shallower parts of what is now the North Sea were dry land. The east coast of present-day England and the coasts of present-day Denmark, Germany and the Netherlands were connected by the former landmass known as Doggerland, forming the British Peninsula on the European mainland. Wales was free of glaciers by about 10,250 BP, the warmer climate allowing the area to become heavily wooded. The post-glacial rise in sea level separated Wales and Ireland, forming the Irish Sea. Doggerland was submerged by the North Sea and, by 8,000 BP, the British Peninsula had become an island. By the beginning of the Neolithic (c. 6,000 BP) sea levels in the Bristol Channel were still about 33 feet (10 metres) lower than today. John Davies has theorised that the story of Cantre'r Gwaelod's drowning and tales in the Mabinogion, of the waters between Wales and Ireland being narrower and shallower, may be distant folk memories of this time. Neolithic colonists integrated with the indigenous people, gradually changing their lifestyles from a nomadic life of hunting and gathering, to become settled farmers about 6,000 BP – the Neolithic Revolution. They cleared the forests to establish pasture and to cultivate the land, developed new technologies such as ceramics and textile production, and built cromlechs such as Pentre Ifan, Bryn Celli Ddu and Parc Cwm long cairn between about 5,800 BP and 5,500 BP. In common with people living all over Britain, over the following centuries the people living in what was to become known as Wales assimilated immigrants and exchanged ideas of the Bronze Age and Iron Age Celtic cultures. According to John T. Koch and others, Wales in the Late Bronze Age was part of a maritime trading-networked culture that also included the other Celtic nations. This view, sometimes called "Atlantic-Celtic", stands against the view that the Celtic languages have their origins farther east with the Hallstatt culture. 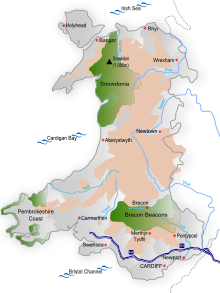 By the time of the Roman invasion of Britain the area of modern Wales had been divided among the tribes of the Deceangli, Ordovices, Cornovii, Demetae and Silures for centuries. The Roman conquest of Wales began in AD 48 and took 30 years to complete. Roman rule lasted over 300 years. The campaigns of conquest are the most widely known feature of Wales during the Roman era, because of the spirited, but ultimately unsuccessful, defence of their homelands by two native tribes: the Silures and the Ordovices. Roman rule in Wales was a military occupation, save for the southern coastal region of south Wales, east of the Gower Peninsula, where there is a legacy of Romanisation. The only town in Wales founded by the Romans, Caerwent, is in south east Wales. Both Caerwent and Carmarthen, also in southern Wales, became Roman civitates. Wales had a rich mineral wealth. The Romans used their engineering technology to extract large amounts of gold, copper and lead, as well as modest amounts of some other metals such as zinc and silver. Roman economic development was concentrated in south-eastern Britain, and no significant industries located in Wales. This was largely a matter of circumstance, as Wales had none of the necessary materials in suitable combination, and the forested, mountainous countryside was not amenable to industrialisation. Although Latin became the official language of Wales, the people tended to continue to speak in Brythonic. While Romanisation was far from complete, the upper classes of Wales began to consider themselves Roman, particularly after the ruling of 212 that granted Roman citizenship to all free men throughout the Empire. Further Roman influence came through the spread of Christianity, which gained many followers when Christians were allowed to worship freely; state persecution ceased in the 4th century, as a result of Constantine I issuing an edict of toleration in 313. Early historians, including the 6th-century cleric Gildas, have noted 383 as a significant point in Welsh history, as it is stated in literature as the foundation point of several medieval royal dynasties. In that year the Roman general Magnus Maximus, or Macsen Wledig, stripped all of western and northern Britain of troops and senior administrators, to launch a successful bid for imperial power; continuing to rule Britain from Gaul as emperor. Gildas, writing in about 540, says that Maximus departed Britain, taking with him all of its Roman troops, armed bands, governors and the flower of its youth, never to return. Having left with the troops and Roman administrators, and planning to continue as the ruler of Britain in the future, his practical course was to transfer local authority to local rulers. The earliest Welsh genealogies give Maximus the role of founding father for several royal dynasties, including those of Powys and Gwent. It was this transfer of power that has given rise to the belief that he was the father of the Welsh Nation. 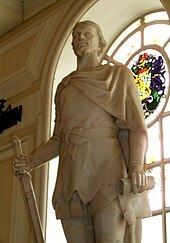 He is given as the ancestor of a Welsh king on the Pillar of Eliseg, erected nearly 500 years after he left Britain, and he figures in lists of the Fifteen Tribes of Wales. Britain in AD 500: The areas shaded pink on the map were inhabited by the Britons, here labelled Welsh. The pale blue areas in the east were controlled by Germanic tribes, whilst the pale green areas to the north were inhabited by the Gaels and Picts. The 400-year period following the collapse of Roman rule is the most difficult to interpret in the history of Wales. After the Roman departure from Britain in AD 410, much of the lowlands of Britain to the east and south-east was overrun by various Germanic peoples. Before extensive studies of the distribution of R1b Y-DNA subclades, some previously maintained that native Britons were displaced by the invaders. This idea has been discarded in the face of evidence that much of the population has, at the latest, Hallstatt era origins, but probably late Neolithic, or at earliest Mesolithic origins with little contribution from Anglo-Saxon source areas. However, by AD 500, the land that would become Wales had divided into a number of kingdoms free from Anglo-Saxon rule. The kingdoms of Gwynedd, Powys, Dyfed and Seisyllwg, Morgannwg and Gwent emerged as independent Welsh successor states. Archaeological evidence, in the Low Countries and what was to become England, shows early Anglo-Saxon migration to Great Britain reversed between 500 and 550, which concurs with Frankish chronicles. John Davies notes this as consistent with the British victory at Badon Hill, attributed to Arthur by Nennius. This tenacious survival by the Romano-Britons and their descendants in the western kingdoms was to become the foundation of what we now know as Wales. With the loss of the lowlands, England's kingdoms of Mercia and Northumbria, and later Wessex, wrestled with Powys, Gwent and Gwynedd to define the frontier between the two peoples. Having lost much of what is now the West Midlands to Mercia in the 6th and early 7th centuries, a resurgent late-7th-century Powys checked Mercian advances. Aethelbald of Mercia, looking to defend recently acquired lands, had built Wat's Dyke. According to John Davies, this endeavour may have been with the agreement of Powys king Elisedd ap Gwylog, as this boundary, extending north from the valley of the River Severn to the Dee estuary, gave Oswestry to Powys. Another theory, after carbon dating placed the dyke's existence 300 years earlier, is that it may have been built by the post-Roman rulers of Wroxeter. King Offa of Mercia seems to have continued this consultative initiative when he created a larger earthwork, now known as Offa's Dyke (Clawdd Offa). Davies wrote of Cyril Fox's study of Offa's Dyke: "In the planning of it, there was a degree of consultation with the kings of Powys and Gwent. On the Long Mountain near Trelystan, the dyke veers to the east, leaving the fertile slopes in the hands of the Welsh; near Rhiwabon, it was designed to ensure that Cadell ap Brochwel retained possession of the Fortress of Penygadden." And, for Gwent, Offa had the dyke built "on the eastern crest of the gorge, clearly with the intention of recognizing that the River Wye and its traffic belonged to the kingdom of Gwent." However, Fox's interpretations of both the length and purpose of the Dyke have been questioned by more recent research. Offa's Dyke largely remained the frontier between the Welsh and English, though the Welsh would recover by the 12th century the area between the Dee (Afon Dyfrdwy) and the Conwy, known then as Y Berfeddwlad. By the 8th century, the eastern borders with the Anglo-Saxons had broadly been set. In 853, the Vikings raided Anglesey, but in 856, Rhodri Mawr defeated and killed their leader, Gorm. The Britons of Wales later made their peace with the Vikings and Anarawd ap Rhodri allied with the Norsemen occupying Northumbria to conquer the north. This alliance later broke down and Anarawd came to an agreement with Alfred, king of Wessex, with whom he fought against the west Welsh. According to Annales Cambriae, in 894, "Anarawd came with the Angles and laid waste Ceredigion and Ystrad Tywi." The southern and eastern parts of Great Britain lost to English settlement became known in Welsh as Lloegyr (Modern Welsh Lloegr), which may have referred to the kingdom of Mercia originally and which came to refer to England as a whole. [nb 1] The Germanic tribes who now dominated these lands were invariably called Saeson, meaning "Saxons". The Anglo-Saxons called the Romano-British *Walha, meaning 'Romanised foreigner' or 'stranger'. The Welsh continued to call themselves Brythoniaid (Brythons or Britons) well into the Middle Ages, though the first written evidence of the use of Cymru and y Cymry is found in a praise poem to Cadwallon ap Cadfan (Moliant Cadwallon, by Afan Ferddig) c. 633. In Armes Prydain, believed to be written around 930–942, the words Cymry and Cymro are used as often as 15 times. However, from the Anglo-Saxon settlement onwards, the people gradually begin to adopt the name Cymry over Brythoniad. From 800 onwards, a series of dynastic marriages led to Rhodri Mawr's (r. 844–77) inheritance of Gwynedd and Powys. His sons, in turn, would found three principal dynasties (Aberffraw for Gwynedd, Dinefwr for Deheubarth and Mathrafal for Powys). Rhodri's grandson Hywel Dda (r. 900–50) founded Deheubarth out of his maternal and paternal inheritances of Dyfed and Seisyllwg in 930, ousted the Aberffraw dynasty from Gwynedd and Powys and then codified Welsh law in the 940s. Maredudd ab Owain (r. 986–99) of Deheubarth (Hywel's grandson) would, (again) temporarily oust the Aberffraw line from control of Gwynedd and Powys. Maredudd's great-grandson (through his daughter Princess Angharad) Gruffydd ap Llywelyn (r. 1039–63) would conquer his cousins' realms from his base in Powys, and even extend his authority into England. Historian John Davies states that Gruffydd was "the only Welsh king ever to rule over the entire territory of Wales... Thus, from about 1057 until his death in 1063, the whole of Wales recognised the kingship of Gruffydd ap Llywelyn. For about seven brief years, Wales was one, under one ruler, a feat with neither precedent nor successor." 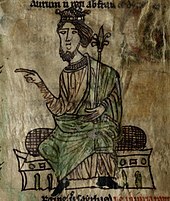 Owain Gwynedd (1100–70) of the Aberffraw line was the first Welsh ruler to use the title princeps Wallensium (prince of the Welsh), a title of substance given his victory on the Berwyn Mountains, according to John Davies. Within four years of the Battle of Hastings, England had been completely subjugated by the Normans. William I of England established a series of lordships, allocated to his most powerful warriors along the Welsh border, the boundaries fixed only to the east (where they met other feudal properties inside England). Starting in the 1070s, these lords began conquering land in southern and eastern Wales, west of the River Wye. The frontier region, and any English-held lordships in Wales, became known as Marchia Wallie, the Welsh Marches, in which the Marcher Lords were subject to neither English nor Welsh law. The area of the March varied as the fortunes of the Marcher Lords and the Welsh princes ebbed and flowed. Owain Gwynedd's grandson Llywelyn Fawr (the Great, 1173–1240), wrested concessions[which?] through Magna Carta in 1215 and receiving the fealty of other Welsh lords in 1216 at the council at [Aberdyfi, became the first Prince of Wales. His grandson Llywelyn ap Gruffuddalso secured the recognition of the title Prince of Wales from Henry III with the Treaty of Montgomery in 1267. Later however, a succession of disputes, including the imprisonment of Llywelyn's wife Eleanor, daughter of Simon de Montfort, culminated in the first invasion by King Edward I of England. As a result of military defeat, the Treaty of Aberconwy exacted Llywelyn's fealty to England in 1277. Peace was short lived and, with the 1282 Edwardian conquest, the rule of the Welsh princes permanently ended. With Llywelyn's death and his brother prince Dafydd's execution, the few remaining Welsh lords did homage for their lands to Edward I. Llywelyn's head was carried through London on a spear; his baby daughter Gwenllian was locked in the priory at Sempringham, where she remained until her death 54 years later. The English interpretation of the treason of Llywelyn was that his fiefdom had escheated to the king. The Statute of Rhuddlan in 1284 provided the constitutional basis for post-conquest government of the Principality of North Wales from 1284 until 1535/6. It defined all of Wales as "annexed and united" to the English Crown, still separate from England but under the same monarch. The king ruled directly in two areas: the Statute divided the north and delegated administrative duties to the Justice of Chester and Justiciar of North Wales, and further south in western Wales the King's authority was delegated to the Justiciar of South Wales. The existing royal lordships of Montgomery and Builth remained unchanged, and the remainder of Wales was still controlled by the marcher lords. To help maintain his dominance, Edward constructed a series of great stone castles: Beaumaris, Caernarfon and Conwy. His son, the future Edward II, was born at Edward's new castle at Caernarfon in 1284. He became the first English Prince of Wales in 1301, which at the time provided an income from northwest Wales known as the Principality of Wales. The title is granted by the monarch to the heir apparent as a personal honour or dignity, and is not heritable, merging with the Crown on accession to the throne. After the failed revolt in 1294–95 of Madog ap Llywelyn – who styled himself Prince of Wales in the Penmachno Document – and the rising of Llywelyn Bren (1316), the next major uprising was that led by Owain Glyndŵr, against Henry IV of England. In 1404, Owain was reputedly crowned Prince of Wales in the presence of emissaries from France, Spain and Scotland. Glyndŵr went on to hold parliamentary assemblies at several Welsh towns, including Machynlleth. But the rebellion failed, and Owain went into hiding in 1412; peace was essentially restored in Wales by 1415. The last remnants of Celtic-tradition Welsh law were abolished and replaced by English law by the Laws in Wales Acts 1535 and 1542. All of Wales became unified with the kingdom of England, in the legal jurisdiction of England and Wales; the "Principality of Wales" began to refer to the whole country, though it remained a "principality" only in a ceremonial sense. The lordships of the Marches were abolished, and Wales began electing members of the Westminster parliament. Prior to the British Industrial Revolution, which saw a rapid economic expansion between 1750 and 1850, there were signs of small-scale industries scattered throughout Wales. These ranged from industries connected to agriculture, such as milling and the manufacture of woollen textiles, through to mining and quarrying. Until the Industrial Revolution, Wales had always been reliant on its agricultural output for its wealth and employment and the earliest industrial businesses were small scale and localised in manner. The emerging industrial period commenced around the development of copper smelting in the Swansea area. With access to local coal deposits and a harbour that could take advantage of Cornwall's copper mines and the copper deposits being extracted from the largest copper mine in the world at Parys Mountain on Anglesey, Swansea developed into the world's major centre for non-ferrous metal smelting in the 19th century. The second metal industry to expand in Wales was iron smelting, and iron manufacturing became prevalent in both the north and the south of the country. In the north of Wales, John Wilkinson's Ironworks at Bersham was a significant industry, while in the south, a second world centre of metallurgy was founded in Merthyr Tydfil, where the four ironworks of Dowlais, Cyfarthfa, Plymouth and Penydarren became the most significant hub of iron manufacture in Wales. In the 1820s, south Wales alone accounted for 40% of all pig iron manufactured in Britain. In the late 18th century, slate quarrying began to expand rapidly, most notably in north Wales. The Penrhyn Quarry, opened in 1770 by Richard Pennant, was employing 15,000 men by the late 19th century, and along with Dinorwic Quarry, it dominated the Welsh slate trade. Although slate quarrying has been described as 'the most Welsh of Welsh industries', it is coal mining which has become the single industry synonymous with Wales and its people. Initially, coal seams were exploited to provide energy for local metal industries but, with the opening of canal systems and later the railways, Welsh coal mining saw a boom in its demand. As the South Wales coalfield was exploited, Cardiff, Swansea, Penarth and Barry grew as world exporters of coal. By its height in 1913, Wales was producing almost 61 million tons of coal. As well as in south Wales, there was also a significant coalfield in the north-east of the country, particularly around Wrexham. 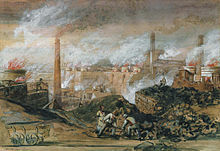 As Wales was reliant on the production of capital goods rather than consumer goods, it possessed few of the skilled craftspeople and artisans found in the workshops of Birmingham or Sheffield in England and had few factories producing finished goods – a key feature of most regions associated with the Industrial Revolution. However, there is increasing support that the industrial revolution was reliant on harnessing the energy and materials provided by Wales and, in that sense, Wales was of central importance. Historian Kenneth Morgan described Wales on the eve of the First World War as a "relatively placid, self-confident and successful nation". Output from the coalfields continued to increase, with the Rhondda Valley recording a peak of 9.6 million tons of coal extracted in 1913. The outbreak of the First World War (1914–1918) saw Wales, as part of the United Kingdom, enter hostilities with Germany. A total of 272,924 Welshmen served in the war, representing 21.5 per cent of the male population. Of these, roughly 35,000 were killed. The two most notable battles of the War to include Welsh forces were those at Mametz Wood on the Somme and the Battle of Passchendaele. The first quarter of the 20th century also saw a shift in the political landscape of Wales. Since 1865, the Liberal Party had held a parliamentary majority in Wales and, following the general election of 1906, only one non-Liberal Member of Parliament, Keir Hardie of Merthyr Tydfil, represented a Welsh constituency at Westminster. Yet by 1906, industrial dissension and political militancy had begun to undermine Liberal consensus in the southern coalfields. In 1916, David Lloyd George became the first Welshman to become Prime Minister of Britain when he was made head of the 1916 coalition government. In December 1918, Lloyd George was re-elected at the head of a Conservative-dominated coalition government, and his poor handling of the 1919 coal miners' strike was a key factor in destroying support for the Liberal party in south Wales. The industrial workers of Wales began shifting towards a new political organisation, established by Hardie and others to ensure an elected representation for the working class, which is now called the Labour Party. When in 1908 the Miners' Federation of Great Britain became affiliated to the Labour Party, the four Labour candidates sponsored by miners were all elected as MPs. By 1922, half the Welsh seats at Westminster were held by Labour politicians—the start of a Labour hegemony that dominated Wales into the 21st century. After economic growth in the first two decades of the 20th century, Wales' staple industries endured a prolonged slump from the early 1920s to the late 1930s, leading to widespread unemployment and poverty in the south Wales valleys. For the first time in centuries, the population of Wales went into decline; unemployment reduced only with the production demands of the Second World War. The war saw Welsh servicemen and women fight in all the major theatres, with some 15,000 of them killed. Bombing raids brought major loss of life as the German Air Force targeted the docks at Swansea, Cardiff and Pembroke. After 1943, 10 per cent of Welsh conscripts aged 18 were sent to work in the coal mines, where there were labour shortages; they became known as Bevin Boys. Pacifist numbers during both World Wars were fairly low, especially in the Second World War, which was seen as a fight against fascism. Of the political parties active in Wales, only Plaid Cymru took a neutral stance, on the grounds that it was an "imperialist war". The 20th century saw a revival in Welsh national feeling. Plaid Cymru was formed in 1925, seeking greater autonomy or independence from the rest of the UK. The term "England and Wales" became common for describing the area to which English law applied, and in 1955 Cardiff was proclaimed as Wales' capital. Cymdeithas yr Iaith Gymraeg (The Welsh Language Society) was formed in 1962, in response to long-held fears that the language might soon die out. Nationalist sentiment grew following the flooding of the Tryweryn valley in 1965 to create a reservoir to supply water to the English city of Liverpool. Although 35 of the 36 Welsh MPs voted against the bill (one abstained), Parliament passed the bill and the village of Capel Celyn was submerged, highlighting Wales' powerlessness in her own affairs in the face of the numerical superiority of English MPs in Parliament. Both the Free Wales Army and Mudiad Amddiffyn Cymru (Welsh Defence Movement, abbreviated as MAC) were formed as a direct result of the Tryweryn destruction, conducting campaigns from 1963. In the years leading up to the investiture of Charles as Prince of Wales in 1969, these groups were responsible for a number of bomb blasts—destroying water pipes, tax and other offices and part of the dam at the new Clywedog reservoir project in Montgomeryshire, being built to supply water to the English Midlands. At a by-election in 1966, Gwynfor Evans won the parliamentary seat of Carmarthen, Plaid Cymru's first Parliamentary seat. The next year, the Wales and Berwick Act 1746 was repealed and a legal definition of Wales and of the boundary with England was stated. By the end of the 1960s, the regional policy of bringing businesses into disadvantaged areas of Wales through financial incentives had proven very successful in diversifying the industrial economy. This policy, begun in 1934, was enhanced by the construction of industrial estates and improvements in transport communications, most notably the M4 motorway linking south Wales directly to London. It was believed that the foundations for stable economic growth had been firmly established in Wales during this period, but this was shown to be wildly optimistic after the recession of the early 1980s saw the collapse of much of the manufacturing base that had been built over the preceding forty years. In the first referendum, in 1979, the Welsh electorate voted against the creation of a Welsh assembly with an 80 per cent majority for the "no" vote. In 1997, a second referendum on the same issue secured a "yes" by a very narrow majority (50.3 per cent). The National Assembly for Wales (Cynulliad Cenedlaethol Cymru) was set up in 1999 (under the Government of Wales Act 1998) and has the power to determine how Wales' central government budget is spent and administered, although the UK parliament reserves the right to set limits on the powers of the Welsh Assembly. The governments of the United Kingdom and of Wales almost invariably define Wales as a country. The Welsh Government says: "Wales is not a Principality. Although we are joined with England by land, and we are part of Great Britain, Wales is a country in its own right." The title Prince of Wales is still conferred on the heir apparent to the British throne, currently Prince Charles, but he has no constitutional role in modern Wales. According to the Welsh Government: "Our Prince of Wales at the moment is Prince Charles, who is the present heir to the throne. But he does not have a role in the governance of Wales, even though his title might suggest that he does." Wales is a country that is part of the United Kingdom. Constitutionally, the UK is a de jure unitary state, its parliament and government in Westminster. In the House of Commons – the lower house of the UK parliament – Wales is represented by 40 MPs (out of 650) from Welsh constituencies. At the 2017 general election, 28 Labour and Labour Co-op MPs were elected, eight Conservative MPs and four Plaid Cymru MPs. The Wales Office is a department of the United Kingdom government responsible for Wales, whose minister the Secretary of State for Wales sits in the UK cabinet. Alun Cairns has been Secretary of State for Wales since March 2016. Wales held a referendum in 1997 and chose to establish a form of self-government. The consequent process of devolution began with the Government of Wales Act 1998, which created the National Assembly for Wales (Welsh: Cynulliad Cenedlaethol Cymru). Powers of the Secretary of State for Wales were transferred to the devolved government on 1 July 1999, granting the Assembly the power to decide how the Westminster government's budget for devolved areas is spent and administered. The 1998 Act was amended by the Government of Wales Act 2006, which enhanced the Assembly's powers, giving it legislative powers akin to those of the Scottish Parliament and Northern Ireland Assembly. The Assembly has 60 members, known as Assembly Members (Aelodau y Cynulliad). Members (AMs (ACau)) are elected to four-year terms under an additional member system. Forty of the AMs represent geographical constituencies, elected under the First Past the Post system. The remaining 20 AMs represent five electoral regions, each including between seven and nine constituencies, using the d'Hondt method of proportional representation. The Assembly must elect a First Minister, who selects ministers to form the Welsh Government. Labour remained the largest Assembly party following the 2007 election, winning 26 of the 60 seats. Having insufficient support to form a government, the Labour Party entered into the 'One Wales' agreement with Plaid Cymru, forming a coalition, with the Labour leader as First Minister. Carwyn Jones has been First Minister and leader of Welsh Labour since Rhodri Morgan retired from office in December 2009, after nine years and ten months as First Minister. Ieuan Wyn Jones, Deputy First Minister in the coalition government, was leader of Plaid Cymru, the second-largest party in the Assembly with 14 of the 60 seats. Under the 'One Wales' agreement, a referendum on giving the Welsh assembly full law-making powers was promised "as soon as practicable, at or before the end of the assembly term (in 2011)" and both parties have agreed "in good faith to campaign for a successful outcome to such a referendum". Welsh Labour remained the largest party in the Assembly following the National Assembly for Wales election, 2011, winning 30 of the 60 seats. Other parties represented in the assembly were the Welsh Conservatives (the loyal opposition) with 14 seats, Plaid Cymru, who have 11 seats, and the Welsh Liberal Democrats, with five seats. Carwyn Jones remained First Minister following the election, this time leading a Welsh Labour ministerial team. The Presiding Officer of the Assembly was Rosemary Butler of Welsh Labour. After the May 2016 election, Labour continues to form the largest group in the Assembly, with 29 AMs. Following the election, the vote for First Minister initially resulted in a tie between Jones (Labour) and Leanne Wood (Plaid Cymru). After discussions amongst the parties, a Labour government including the Liberal Democrat AM as Minister for Education was proposed with limited policy-based support from Plaid Cymru, and Jones was re-elected as First Minister. Initially, Plaid Cymru formed the official opposition, with twelve AMs and the Conservative Party were the third party with eleven AMs. In August 2016, one of the UKIP AMs left his group and continues to sit as an Independent member, and in October 2016, former Plaid Cymru president and inaugural Presiding Officer of the National Assembly Dafydd Elis-Thomas left his party and also continues to sit as an Independent member. In April 2017, a second UKIP AM left the party and joined the Conservative Assembly group without joining the party. The twenty areas of responsibility devolved to the Welsh Government, known as "subjects", include agriculture, economic development, education, health, housing, local government, social services, tourism, transport and the Welsh language. On its creation in 1999, the National Assembly for Wales had no primary legislative powers. But since the Government of Wales Act 2006 (GoWA 2006) came into effect in 2007, the Assembly has power to pass primary legislation as Assembly Measures on some specific matters within the areas of devolved responsibility. Further matters have been added subsequently, either directly by the UK Parliament or by the UK Parliament approving a Legislative Competence Order (LCO, a request from the National Assembly for additional powers). The GoWA 2006 allows for the Assembly to gain primary lawmaking powers on a more extensive range of matters within the same devolved areas if approved in a referendum. A referendum on extending the lawmaking powers of the National Assembly was accordingly held on 3 March 2011. It asked: "Do you want the Assembly now to be able to make laws on all matters in the 20 subject areas it has powers for?" 63.49 per cent of voters voted 'yes', and 36.51 per cent voted 'no'. Consequently, the Assembly became empowered to make laws, known as Acts of the Assembly, on all matters in the subject areas, without needing the UK Parliament's agreement. Wales is an electoral constituency of the European Union represented by four of the 751 Members of the European Parliament. Relations between Wales and the United States are primarily conducted through the Prime Minister of the United Kingdom, in addition to her Secretary of Foreign Affairs and Ambassador to the United States. Nevertheless, the Welsh Assembly has deployed their own envoy to America, primarily to promote Wales-specific business interests. The primary Welsh Government Office is based in the Washington British Embassy, with satellites in New York, Chicago, San Francisco, and Atlanta. Commensurately, the United States has established a caucus to build direct relations with Wales. For the purposes of local government, Wales has been divided into 22 council areas since 1996. These "principal areas" are responsible for the provision of all local government services, including education, social work, environment and roads services. Note: Wales has six cities. In addition to Cardiff, Newport and Swansea, the communities of Bangor, St Asaph and St Davids also have city status in the United Kingdom. By tradition, Welsh Law was compiled during an assembly held at Whitland around 930 by Hywel Dda, king of most of Wales between 942 and his death in 950. The 'law of Hywel Dda' (Welsh: Cyfraith Hywel), as it became known, codified the previously existing folk laws and legal customs that had evolved in Wales over centuries. Welsh Law emphasised the payment of compensation for a crime to the victim, or the victim's kin, rather than punishment by the ruler. Other than in the Marches, where law was imposed by the Marcher Lords, Welsh Law remained in force in Wales until the Statute of Rhuddlan in 1284. Edward I of England annexed the Principality of Wales following the death of Llywelyn ap Gruffudd, and Welsh Law was replaced for criminal cases under the Statute. Marcher Law and Welsh Law (for civil cases) remained in force until Henry VIII of England annexed the whole of Wales under the Laws in Wales Acts 1535 and 1542 (often referred to as the Acts of Union of 1536 and 1543), after which English law applied to the whole of Wales. The Wales and Berwick Act 1746 provided that all laws that applied to England would automatically apply to Wales (and the Anglo-Scottish border town of Berwick) unless the law explicitly stated otherwise; this Act was repealed with regard to Wales in 1967. English law has been the legal system of England and Wales since 1536, although there is now a growing body of contemporary Welsh law following Welsh devolution. English law is regarded as a common law system, with no major codification of the law and legal precedents are binding as opposed to persuasive.The court system is headed by the Supreme Court of the United Kingdom which is the highest court of appeal in the land for criminal and civil cases. The Senior Courts of England and Wales is the highest court of first instance as well as an appellate court. The three divisions are the Court of Appeal; the High Court of Justice and the Crown Court. Minor cases are heard by the Magistrates' Courts or the County Court. In 2007 the Wales and Cheshire Region (known as the Wales and Cheshire Circuit before 2005) came to an end when Cheshire was attached to the North-Western England Region. From that point, Wales became a legal unit in its own right, although it remains part of the single jurisdiction of England and Wales. The Welsh Assembly has the authority to draft and approve laws outside of the UK Parliamentary system to meet the specific needs of Wales. Under powers approved by a referendum held in March 2011, it is empowered to pass primary legislation known as Acts of the Assembly in relation to twenty subjects listed in the Government of Wales Act 2006 such as health and education. Through this primary legislation, the Welsh Government can then also enact more specific secondary legislation. Wales is served by four regional police forces, Dyfed-Powys Police, Gwent Police, North Wales Police and South Wales Police. There are five prisons in Wales; four in the southern half of the country and one in Wrexham. Wales has no women's prisons; female inmates are imprisoned in England. Map of Wales. From Ortelius: Theatrum Orbis Terrarum c.1574. Wales is a generally mountainous country on the western side of central southern Great Britain. It is about 170 miles (270 km) north–south and 60 miles (97 km) east–west. The oft-quoted 'size of Wales' is about 20,779 km2 (8,023 sq mi). 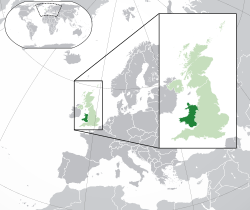 Wales is bordered by England to the east and by sea in all other directions: the Irish Sea to the north and west, St George's Channel and the Celtic Sea to the southwest and the Bristol Channel to the south. Wales has about 1,680 miles (2,700 km) of coastline (along the mean high water mark), including the mainland, Anglesey and Holyhead. Over 50 islands lie off the Welsh mainland; the largest being Anglesey, in the north-west. Much of Wales' diverse landscape is mountainous, particularly in the north and central regions. The mountains were shaped during the last ice age, the Devensian glaciation. The highest mountains in Wales are in Snowdonia (Eryri), of which five are over 1,000 m (3,300 ft). The highest of these is Snowdon (Yr Wyddfa), at 1,085 m (3,560 ft). The 14 Welsh mountains, or 15 if including Garnedd Uchaf – often discounted because of its low topographic prominence – over 3,000 feet (910 metres) high are known collectively as the Welsh 3000s and are located in a small area in the north-west. The highest outside the 3000s is Aran Fawddwy, at 905 metres (2,969 feet), in the south of Snowdonia. 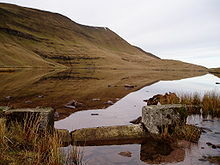 The Brecon Beacons (Bannau Brycheiniog) are in the south (highest point Pen y Fan, at 886 metres (2,907 feet)), and are joined by the Cambrian Mountains in Mid Wales (highest point Pumlumon, at 752 metres (2,467 feet)). Wales has three national parks: Snowdonia, Brecon Beacons and Pembrokeshire Coast. It has five Areas of Outstanding Natural Beauty; Anglesey, the Clwydian Range and Dee Valley, the Gower Peninsula, the Llŷn Peninsula, and the Wye Valley. The Gower Peninsula was the first area in the United Kingdom to be designated as an Area of Outstanding Natural Beauty, in 1956. Forty two percent of the coastline of south and west Wales is designated as Heritage Coast, with 13 specific designated strips of coastline maintained by Natural Resources Wales (successor body to the Countryside Council for Wales). As from 2017, the coastline of Wales has 45 Blue Flag beaches and three Blue Flag marinas. Despite its heritage and award-winning beaches; the south and west coasts of Wales, along with the Irish and Cornish coasts, are frequently blasted by Atlantic westerlies/south westerlies that, over the years, have sunk and wrecked many vessels. On the night of 25 October 1859, over 110 ships were destroyed off the coast of Wales when a hurricane blew in from the Atlantic. More than 800 lives were lost across Britain because of the storm, but the greatest tragedy was the sinking of the Royal Charter off the coast of Anglesey in which 459 people died. The number of shipwrecks around the coast of Wales reached a peak in the 19th century with over 100 vessels lost and an average loss of life of about 78 sailors per year. Wartime action caused losses near Holyhead, Milford Haven and Swansea. Because of offshore rocks and unlit islands, Anglesey and Pembrokeshire are still notorious for shipwrecks, most notably the Sea Empress oil spill in 1996. The first border between Wales and England was zonal, apart from around the River Wye, which was the first accepted boundary. Offa's Dyke was supposed to form an early distinct line but this was thwarted by Gruffudd ap Llewellyn, who reclaimed swathes of land beyond the dyke. The Act of Union of 1536 formed a linear border stretching from the mouth of the Dee to the mouth of the Wye. Even after the Act of Union, many of the borders remained vague and moveable until the Welsh Sunday Closing act of 1881, which forced local businesses to decide which country they fell within to accept either the Welsh or English law. The earliest geological period of the Paleozoic era, the Cambrian, takes its name from the Cambrian Mountains, where geologists first identified Cambrian remnants. In evolutionary studies the Cambrian is the period when most major groups of complex animals appeared (the Cambrian explosion). The older rocks underlying the Cambrian rocks in Wales lacked fossils which could be used to differentiate their various groups and were referred to as Pre-cambrian. In the mid-19th century, two prominent geologists, Roderick Murchison and Adam Sedgwick (who first proposed the name of the Cambrian period), independently used their studies of the geology of Wales to establish certain principles of stratigraphy and palaeontology. The next two periods of the Paleozoic era, the Ordovician and Silurian, were named after ancient Celtic tribes from this area based on Murchison's and Sedgwick's work. Wales lies within the north temperate zone. It has a changeable, maritime climate and is one of the wettest countries in Europe. Welsh weather is often cloudy, wet and windy, with warm summers and mild winters. The long summer days and short winter days result from Wales' northerly latitudes (between 53° 43′ N and 51° 38′ N). Aberystwyth, at the midpoint of the country's west coast, has nearly 17 hours of daylight at the summer solstice. Daylight at midwinter there falls to just over seven and a half hours. The country's wide geographic variations cause localised differences in sunshine, rainfall and temperature. Average annual coastal temperatures reach 10.5 °C (51 °F) and in low lying inland areas, 1 °C (1.8 °F) lower. It becomes cooler at higher altitudes; annual temperatures decrease on average approximately 0.5 °C (0.9 °F) each 100 metres (330 feet) of altitude. Consequently, the higher parts of Snowdonia experience average annual temperatures of 5 °C (41 °F). Temperatures in Wales remain higher than would otherwise be expected at its latitude because of the North Atlantic Drift, a branch of the Gulf Stream. The ocean current, bringing warmer water to northerly latitudes, has a similar effect on most of north-west Europe. As well as its influence on Wales' coastal areas, air warmed by the Gulf Stream blows further inland with the prevailing winds. At low elevations, summers tend to be warm and sunny. Average maximum temperatures range between 19 and 22 °C (66 and 72 °F). Winters tend to be fairly wet, but rainfall is rarely excessive and the temperature usually stays above freezing. Spring and autumn feel quite similar and the temperatures tend to stay above 14 °C (57 °F) – also the average annual daytime temperature. The sunniest time of year tends to be between May and August. 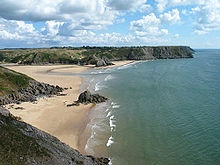 The south-western coast is the sunniest part of Wales, averaging over 1700 hours of sunshine annually. Wales' sunniest town is Tenby, Pembrokeshire. The dullest time of year tends to be between November and January. The least sunny areas are the mountains, some parts of which average less than 1200 hours of sunshine annually. The prevailing wind is south-westerly. Coastal areas are the windiest, gales occur most often during winter, on average between 15 and 30 days each year, depending on location. Inland, gales average fewer than six days annually. Rainfall patterns show significant variation. The further west, the higher the expected rainfall; up to 40% more. At low elevations, rain is unpredictable at any time of year, although the showers tend to be shorter in summer. The uplands of Wales have most rain, normally more than 50 days of rain during the winter months (December to February), falling to around 35 rainy days during the summer months (June to August). Annual rainfall in Snowdonia averages between 3,000 millimetres (120 in) (Blaenau Ffestiniog) and 5,000 millimetres (200 in) (Snowdon's summit). The likelihood is that it will fall as sleet or snow when the temperature falls below 5 °C (41 °F) and snow tends to be lying on the ground there for an average of 30 days a year. Snow falls several times each winter in inland areas but is relatively uncommon around the coast. Average annual rainfall in those areas can be less than 1,000 millimetres (39 in). Highest maximum temperature: 35.2 °C (95 °F) at Hawarden Bridge, Flintshire on 2 August 1990. Lowest minimum temperature: −23.3 °C (−10 °F) at Rhayader, Radnorshire (now Powys) on 21 January 1940. Maximum number of hours of sunshine in a month: 354.3 hours at Dale Fort, Pembrokeshire in July 1955. Minimum number of hours of sunshine in a month: 2.7 hours at Llwynon, Brecknockshire in January 1962. Maximum rainfall in a day (0900 UTC − 0900 UTC): 211 millimetres (8.3 in) at Rhondda, Glamorgan, on 11 November 1929. Wettest spot – an average of 4,473 millimetres (176 in) rain a year at Crib Goch in Snowdonia, Gwynedd (making it also the wettest spot in the United Kingdom). Wales' wildlife is typical of Britain with several distinctions. Because of its long coastline, Wales hosts a variety of seabirds. The coasts and surrounding islands are home to colonies of gannets, Manx shearwater, puffins, kittiwakes, shags and razorbills. In comparison, with 60 per cent of Wales above the 150m contour, the country also supports a variety of upland habitat birds, including raven and ring ouzel. Birds of prey include the merlin, hen harrier and the red kite, a national symbol of Welsh wildlife. In total, more than 200 different species of bird have been seen at the RSPB reserve at Conwy, including seasonal visitors. Larger mammals, including brown bears, wolves and wildcats, died out during the Norman period. Today, mammals include shrews, voles, badgers, otters, stoats, weasels, hedgehogs and fifteen species of bat. Two species of small rodent, the yellow-necked mouse and the dormouse, are of special Welsh note being found at the historically undisturbed border area. The pine marten, which has been sighted occasionally, has not been officially recorded since the 1950s. The polecat was nearly driven to extinction in Britain, but hung on in Wales and is now rapidly spreading. Feral goats can be found in Snowdonia. The waters of south-west Wales of Gower, Pembrokeshire and Cardigan Bay attract marine animals, including basking sharks, Atlantic grey seals, leatherback turtles, dolphins, porpoises, jellyfish, crabs and lobsters. Pembrokeshire and Ceredigion, in particular, are recognised as an area of international importance for bottlenose dolphins, and New Quay has the only summer residence of bottlenose dolphins in the whole of the UK. River fish of note include char, eel, salmon, shad, sparling and Arctic char, whilst the gwyniad is unique to Wales, found only in Bala Lake. Wales is also known for its shellfish, including cockles, limpet, mussels and periwinkles. Herring, mackerel and hake are the more common of the country's seafish. The north facing high grounds of Snowdonia support a relict pre-glacial flora including the iconic Snowdon lily – Gagea serotina – and other alpine species such as Saxifraga cespitosa, Saxifraga oppositifolia and Silene acaulis. Wales also hosts a number of plant species not found elsewhere in the UK including the spotted rock-rose Tuberaria guttata on Anglesey and Draba aizoides on the Gower. Over the last 250 years, Wales has been transformed first from a predominantly agricultural country to an industrial, and now a post-industrial economy. Since the Second World War, the service sector has come to account for the majority of jobs, a feature typifying most advanced economies. Total headline Gross Value Added (GVA) in Wales in 2016 was £59.6 billion, or £19,140 per head of population; 72.7 per cent of the average for the UK total, the lowest GVA per head in the UK. In the three months to December 2017, the employment rate for working-age adults in Wales was 72.7 per cent, compared to 75.2 per cent across the UK as a whole. From the middle of the 19th century until the post-war era, the mining and export of coal was a dominant industry. At its peak of production in 1913, nearly 233,000 men and women were employed in the south Wales coalfield, mining 56 million tons of coal. Cardiff was once the largest coal-exporting port in the world and, for a few years before the First World War, handled a greater tonnage of cargo than either London or Liverpool. In the 1920s, over 40% of the male Welsh population worked in heavy industry. According to Professor Phil Williams, the Great Depression "devastated Wales", north and south, because of its "overwhelming dependence on coal and steel". From the mid-1970s, the Welsh economy faced massive restructuring with large numbers of jobs in traditional heavy industry disappearing and being replaced eventually by new ones in light industry and in services. In the late 1970s and early 1980s, Wales was successful in attracting an above average share of foreign direct investment in the UK. However, much of the new industry was essentially of a "branch factory" ("screwdriver factory") type where a manufacturing plant or call centre is located in Wales but the most highly paid jobs in the company are retained elsewhere. Poor-quality soil in much of Wales is unsuitable for crop-growing and livestock farming has traditionally been the focus of agriculture. The Welsh landscape (protected by three national parks) and 45 Blue Flag beaches, as well as the unique culture of Wales, attract large numbers of tourists, who play an especially vital role in the economy of rural areas. Wales has struggled to develop or attract high value-added employment in sectors such as finance and research and development, attributable in part to a comparative lack of 'economic mass' (i.e. population) – Wales lacks a large metropolitan centre. The lack of high value-added employment is reflected in lower economic output per head relative to other regions of the UK – in 2002 it stood at 90% of the EU25 average and around 80% of the UK average. In June 2008, Wales made history by becoming the first nation in the world to be awarded Fairtrade Status. The pound sterling is the currency used in Wales. Numerous Welsh banks issued their own banknotes in the 19th century. The last bank to do so closed in 1908; since then, although banks in Scotland and Northern Ireland continue to have the right to issue banknotes in their own countries, the Bank of England has a monopoly on the issue of banknotes in Wales. The Commercial Bank of Wales, established in Cardiff by Sir Julian Hodge in 1971, was taken over by the Bank of Scotland in 1988 and absorbed into its parent company in 2002. The Royal Mint, who issue the coinage circulated through the whole of the UK, have been based at a single site in Llantrisant since 1980. Since decimalisation, in 1971, at least one of the coins in UK circulation has depicted a Welsh design, e.g. the 1995 and 2000 one Pound coin (above). However, Wales has not been represented on any coin minted from 2008. The M4 motorway running from West London to South Wales links Newport, Cardiff and Swansea. The section of the motorway managed by the Welsh Government is from the Second Severn Crossing to Pont Abraham services. The A55 expressway has a similar role along the north Wales coast, connecting Holyhead and Bangor with Wrexham and Flintshire. It also links to northwest England, principally Chester. The main north-south Wales link is the A470, which runs from Cardiff to Llandudno. Cardiff Airport is the international airport of Wales. Providing links to European, African and North American destinations, it is about 12 miles (19 km) southwest of Cardiff city centre, in the Vale of Glamorgan. Intra-Wales flights run between Anglesey (Valley) and Cardiff, operated since 2017 by Eastern Airways. Other internal flights operate to northern England, Scotland and Northern Ireland. The Welsh Government manages those parts of the British railway network within Wales, through the Transport for Wales Rail train operating company. Cardiff Central is Wales' busiest railway station, with over four times as much passenger traffic as any other station in Wales. The Cardiff region has its own urban rail network. Beeching cuts in the 1960s mean that most of the remaining network is geared toward east-west travel connecting with the Irish Sea ports for ferries to Ireland. Services between north and south Wales operate through the English towns of Chester and Shrewsbury along the Welsh Marches Line. All trains in Wales are diesel-powered since no lines have been electrified. However, the South Wales Main Line branch of the Great Western Main Line used by services from London Paddington to Cardiff is undergoing electrification. Wales has four commercial ferry ports. Regular ferry services to Ireland operate from Holyhead, Pembroke Dock and Fishguard. The Swansea to Cork service was cancelled in 2006, reinstated in March 2010, and withdrawn again in 2012. St. David's Building, Lampeter campus, University of Wales, Trinity Saint David (Prifysgol Cymru, Y Drindod Dewi Sant). Founded in 1822, it is the oldest degree awarding institution in Wales. A distinct education system has developed in Wales. Formal education before the 18th century was the preserve of the elite. 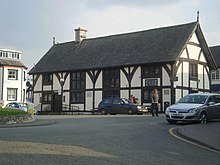 The first grammar schools were established in Welsh towns such as Ruthin, Brecon and Cowbridge. One of the first successful schooling systems was started by Griffith Jones, who introduced the circulating schools in the 1730s; believed to have taught half the country's population to read. In the 19th century, with increasing state involvement in education, Wales was forced to adopt an education system that was English in ethos even though the country was predominantly Non-conformist, Welsh-speaking and demographically uneven because of the economic expansion in the south. In some schools, to ensure Welsh children spoke English at school, the Welsh Not was used; a policy seen as a hated symbol of English oppression. The "not", a piece of wood hung round the neck by string, was given to any child overheard speaking Welsh, who would pass it to a different child if overheard speaking Welsh. At the end of the day, the wearer of the "not" would be beaten. The extent of its practice, however, is difficult to determine. State and local governmental edicts resulted in schooling in the English language which, following Brad y Llyfrau Gleision (the Treachery of the Blue Books), was seen as more academic and worthwhile for children. The University College of Wales opened in Aberystwyth in 1872. Cardiff and Bangor followed, and the three colleges came together in 1893 to form the University of Wales. The Welsh Intermediate Education Act of 1889 created 95 secondary schools. The Welsh Department for the Board of Education followed in 1907, which gave Wales its first significant educational devolution. A resurgence in Welsh-language schools in the latter half of the 20th century at nursery and primary level saw attitudes shift towards teaching in the medium of Welsh. Welsh is a compulsory subject in all of Wales' state schools for pupils aged 5–16 years old. While there has never been an exclusively Welsh-language college, Welsh-medium higher education is delivered through the individual universities and has since 2011 been supported by the Coleg Cymraeg Cenedlaethol (Welsh National College) as a delocalised federal institution. In 2016–2017, there were 1,547 maintained schools in Wales. In 2016–2017, the country had 466,508 pupils taught by 23,910 full-time equivalent teachers. Public healthcare in Wales is provided by NHS Wales (GIG Cymru), which was originally formed as part of the NHS structure for England and Wales created by the National Health Service Act 1946, but with powers over the NHS in Wales coming under the Secretary of State for Wales in 1969. In turn, responsibility for NHS Wales was passed to the Welsh Assembly and Executive under devolution in 1999. Historically, Wales was served by smaller 'cottage' hospitals, built as voluntary institutions. As newer more expensive diagnostic techniques and treatments became available through medical advancement, much of the clinical work of the country has been concentrated in newer, larger district hospitals. In 2006, there were seventeen district hospitals in Wales, although none situated in Powys. NHS Wales provides public healthcare in Wales and employs some 90,000 staff, making it Wales' biggest employer. The Minister for Health and Social Services is the person within the Welsh Government who holds cabinet responsibilities for both health and social care in Wales. A 2009 Welsh health survey, conducted by the Welsh Assembly, reported that 51 per cent of adults reported their health good or excellent, while 21 per cent described their health as fair or poor. The survey also recorded that 27 per cent of Welsh adults had a long-term chronic illness, such as arthritis, asthma, diabetes and heart disease. The 2018 National Survey of Wales, which enquired into health-related lifestyle choices, reported that 19 per cent of the adult population were smokers, 18 per cent admitted drinking alcohol above weekly recommended guidelines, while 53 per cent undertook the recommended 150 minutes of physical activity each week. The population of Wales doubled from 587,000 in 1801 to 1,163,000 in 1851 and had reached 2,421,000 by 1911. Most of the increase came in the coal mining districts, especially Glamorganshire, which grew from 71,000 in 1801 to 232,000 in 1851 and 1,122,000 in 1911. Part of this increase can be attributed to the demographic transition seen in most industrialising countries during the Industrial Revolution, as death rates dropped and birth rates remained steady. However, there was also large-scale migration into Wales during the Industrial Revolution. The English were the most numerous group, but there were also considerable numbers of Irish and smaller numbers of other ethnic groups, including Italians, who migrated to South Wales. Wales also received immigration from various parts of the British Commonwealth of Nations in the 20th century, and African-Caribbean and Asian communities add to the ethnocultural mix, particularly in urban Wales. Many of these self-identify as Welsh. Swansea Bay and city centre. Swansea is Wales' second most populous city. The 2011 census showed Wales' population to be 3,063,456, the highest in its history. In 2011, 27 per cent (837,000) of the total population of Wales were not born in Wales, including 636,000 people (21 per cent of the total population of Wales) who were born in England. The main population and industrial areas are in south Wales, including the cities of Cardiff, Swansea and Newport and the nearby valleys, with another significant population in the north-east around Wrexham and Flintshire. According to the 2001 census, 96 per cent of the population was White British, and 2.1 per cent non-white (mainly of British Asian origin). Most non-white groups were concentrated in Cardiff, Newport and Swansea. Welsh Asian and African communities developed mainly through immigration after the Second World War. In the early 21st century, parts of Wales saw an increased number of immigrants settle from recent EU accession countries such as Poland; though a 2007 study showed a relatively low number of employed immigrant workers from the former Eastern Bloc countries in Wales compared to other regions of the United Kingdom. The 2001 UK census was criticised in Wales for not offering 'Welsh' as an option to describe respondents' national identity. Partly to address this concern, the 2011 census asked the question "How would you describe your national identity?". Respondents were instructed to "tick all that apply" from a list of options that included Welsh. The outcome was that 57.5 per cent of Wales' population indicated their sole national identity to be Welsh; a further 7.1 per cent indicated it to be both Welsh and British. No Welsh national identity was indicated by 34.1 per cent. The proportion giving their sole national identity as British was 16.9 per cent, and another 9.4 per cent included British with another national identity. No British national identity was indicated by 73.7 per cent. 11.2 per cent indicated their sole national identity as English and another 2.6 per cent included English with another national identity. The 2011 census showed Wales to be less ethnically diverse than any region of England: 93.2 per cent classed themselves as White British (including Welsh, English, Scottish or Northern Irish), 2.4 per cent as "Other White" (including Irish), 2.2 per cent as Asian (including Asian British), 1 per cent as Mixed, and 0.6 per cent as Black (African, Caribbean, or Black British). The lowest proportion of White British (80.3 per cent) was in Cardiff. In 2001, a quarter of the Welsh population were born outside Wales, mainly in England; about 3 per cent were born outside the UK. The proportion born in Wales varies across the country, with the highest percentages in the south Wales valleys and the lowest in mid Wales and parts of the north-east. In both Blaenau Gwent and Merthyr Tydfil, 92 per cent were Welsh-born, compared with only 51 per cent and 56 per cent in the border counties of Flintshire and Powys. Just over 1.75 million Americans report themselves to have Welsh ancestry, as did 440,965 Canadians in Canada's 2006 census. The total fertility rate (TFR) in Wales was 1.90 in 2011, which is below the replacement rate of 2.1. The majority of births are to unmarried women (58 per cent of births in 2011 were outside marriage). About one in 10 births (10.7 per cent) in 2011 were to foreign-born mothers, compared to 5.2 per cent in 2001. A 2010 study estimated that 35 per cent of the Welsh population have surnames of Welsh origin (5.4 per cent of the English and 1.6 per cent of the Scottish population also bore 'Welsh' names). However, many modern surnames derived from old Welsh personal names actually arose in England. In his 1707 work Archaeologia Britannica Edward Lhuyd, keeper of the Ashmolean Museum, noted the similarity between the two Celtic language families: Brythonic or P–Celtic (Breton, Cornish and Welsh); and Goidelic or Q–Celtic (Irish, Manx and Scottish Gaelic). He argued that the Brythonic languages originated in Gaul (France) and that the Goidelic languages originated in the Iberian Peninsula. Lhuyd concluded that as the languages had been of Celtic origin, the people who spoke those languages were Celts. (According to a more recent hypothesis, also widely embraced today, Goidelic and Brythonic languages, collectively known as Insular Celtic languages, evolved together for some time separately from Continental Celtic languages such as Gaulish and Celtiberian.) From the 18th century, the peoples of Brittany, Cornwall, Ireland, Isle of Man, Scotland and Wales were known increasingly as Celts, and they are regarded as the modern Celtic nations today. The Bible translations into Welsh helped to maintain the use of Welsh in daily life. 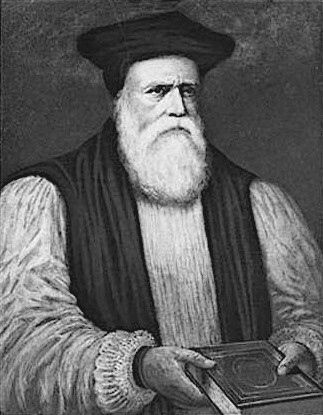 The New Testament was translated by William Salesbury in 1567 followed by the complete Bible by William Morgan in 1588. The Welsh Language Act 1993 and the Government of Wales Act 1998 provide that the English and Welsh languages be treated on a basis of equality, and both are used as working languages within the National Assembly. Both English and Welsh are considered official languages of Wales, with Welsh further recognised in law as having "official status". English is spoken by almost all people in Wales and is the main language in most of the country. Code-switching is common in all parts of Wales and is known by various terms, though none is recognised by professional linguists. "Wenglish" is the Welsh English language dialect. It has been influenced significantly by Welsh grammar and includes words derived from Welsh. According to John Davies, Wenglish has "been the object of far greater prejudice than anything suffered by Welsh". Northern and western Wales retain many areas where Welsh is spoken as a first language by the majority of the population, and English learnt as a second language. The 2011 Census showed 562,016 people, 19.0% of the Welsh population, were able to speak Welsh, a decrease from the 20.8% returned in the 2001 census. Although monoglotism in young children continues, life-long monoglotism in Welsh is recognised to be a thing of the past. Road signs in Wales are generally in both English and Welsh; where place names differ in the two languages, both versions are used (e.g. "Cardiff" and "Caerdydd"). Under new regulations that came into force in 2016, the Welsh Language Commissioner requires local authorities and Welsh Government to ensure that all new or renewed road signs that use both languages to feature the Welsh language first. During the 20th century, a number of small communities of speakers of languages other than Welsh or English, such as Bengali or Cantonese, established themselves in Wales as a result of immigration. The largest religion in Wales is Christianity, with 57.6 per cent of the population describing themselves as Christian in the 2011 census. The Church in Wales with 56,000 adherents has the largest attendance of the denominations. It is a province of the Anglican Communion, and was part of the Church of England until disestablishment in 1920 under the Welsh Church Act 1914. The first Independent Church in Wales was founded at Llanvaches in 1638 by William Wroth. The Presbyterian Church of Wales was born out of the Welsh Methodist revival in the 18th century and seceded from the Church of England in 1811. The second largest attending faith in Wales is Roman Catholic, with an estimated 43,000 adherents. Non-Christian religions are small in Wales, making up approximately 2.7 per cent of the population. The 2011 census recorded 32.1 per cent of people declaring no religion, while 7.6 per cent did not reply to the question. The patron saint of Wales is Saint David (Dewi Sant), with Saint David's Day (Dydd Gŵyl Dewi Sant) celebrated annually on 1 March. In 1904, there was a religious revival (known by some as the 1904–1905 Welsh Revival, or simply The 1904 Revival) which started through the evangelism of Evan Roberts and saw large numbers of people converting to non-Anglican Christianity, sometimes whole communities. Roberts' style of preaching became the blueprint for new religious bodies such as Pentecostalism and the Apostolic Church. The Apostolic Church holds its annual Apostolic Conference in Swansea each year, usually in August. Islam is the largest non-Christian religion in Wales, with 24,000 (0.8 per cent) reported Muslims in the 2011 census. 2 Glynrhondda Street in Cathays, Cardiff, is accepted as the first mosque in the United Kingdom founded by Yemeni and Somali sailors on their trips between Aden and Cardiff Docks. There are also communities of Hindus and Sikhs, mainly in the south Wales cities of Newport, Cardiff and Swansea, while the largest concentration of Buddhists is in the western rural county of Ceredigion. Judaism was the first non-Christian faith to be established in Wales since Roman times, though by 2001 the community has declined to approximately 2,000. Wales has a distinctive culture including its own language, customs, holidays and music. Wales has three UNESCO World Heritage Sites: The Castles and Town walls of King Edward I in Gwynedd; Pontcysyllte Aqueduct; and the Blaenavon Industrial Landscape. The remnants of the native Celtic mythology of the pre-Christian Britons was passed down orally, in much-altered form, by the cynfeirdd (the early poets). 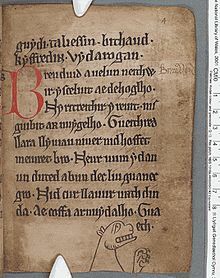 Some of their work survives in much later medieval Welsh manuscripts, known as: the Black Book of Carmarthen and the Book of Aneirin (both 13th-century); the Book of Taliesin and the White Book of Rhydderch (both 14th-century); and the Red Book of Hergest (c. 1400). The prose stories from the White and Red Books are known as the Mabinogion, a title given to them by their first translator, Lady Charlotte Guest, and also used by subsequent translators. Poems such as Cad Goddeu (The Battle of the Trees) and mnemonic list-texts like the Welsh Triads and the Thirteen Treasures of the Island of Britain, also contain mythological material. These texts also include the earliest forms of the Arthurian legend and the traditional history of post-Roman Britain. Other sources of Welsh folklore include the 9th-century Latin historical compilation Historia Britonum (the History of the Britons) and Geoffrey of Monmouth's 12th-century Latin chronicle Historia Regum Britanniae (the History of the Kings of Britain), as well as later folklore, such as The Welsh Fairy Book by W. Jenkyn Thomas. Wales can claim one of the oldest unbroken literary traditions in Europe. The literary tradition of Wales stretches back to the sixth century and includes Geoffrey of Monmouth and Gerald of Wales, regarded by historian John Davies as among the finest Latin authors of the Middle Ages. The earliest body of Welsh verse, by poets Taliesin and Aneirin, survive not in their original form, but in medieval versions and have undergone significant linguistic changes. Welsh poetry and native lore and learning survived the Dark Ages, through the era of the Poets of the Princes (c. 1100 – 1280) and then the Poets of the Gentry (c. 1350 – 1650). The Poets of the Princes were professional poets who composed eulogies and elegies to the Welsh princes while the Poets of the Gentry were a school of poets that favoured the cywydd metre. The period is notable for producing one of Wales' greatest poets, Dafydd ap Gwilym. After the Anglicisation of the gentry the tradition declined. Despite the extinction of the professional poet, the integration of the native elite into a wider cultural world did bring other literary benefits. Renaissance scholars such as William Salesbury and John Davies brought humanist ideals from English universities when they returned to Wales. While in 1588 William Morgan became the first person to translate the Bible into Welsh, from Greek and Hebrew. From the 16th century onwards the proliferation of the 'free-metre' verse became the most important development in Welsh poetry, but from the middle of the 17th century a host of imported accentual metres from England became very popular. By the 19th century the creation of a Welsh epic, fuelled by the eisteddfod, became an obsession with Welsh-language writers. The output of this period was prolific in quantity but unequal in quality. Initially the eisteddfod was askance with the religious denominations, but in time these bodies came to dominate the competitions, with the bardic themes becoming increasingly scriptural and didactic. The period is notable for the adoption by Welsh poets of bardic names, made popular by the eisteddfod movement. Major developments in 19th-century Welsh literature include Lady Charlotte Guest's translation of the Mabinogion, one of the most important medieval Welsh prose tales of Celtic mythology, into English. 1885 saw the publication of Rhys Lewis by Daniel Owen, credited as the first novel written in the Welsh language. The 20th century experienced an important shift away from the stilted and long-winded Victorian Welsh prose, with Thomas Gwynn Jones leading the way with his 1902 work Ymadawiad Arthur. The slaughter in the trenches of the First World War had a profound effect on Welsh literature with a more pessimistic style of prose championed by T. H. Parry-Williams and R. Williams Parry. The industrialisation of south Wales saw a further shift with the likes of Rhydwen Williams who used the poetry and metre of a bygone rural Wales but in the context of an industrial landscape. Though the inter-war period is dominated by Saunders Lewis, for his political and reactionary views as much as his plays, poetry and criticism. The careers of some 1930s writers continued after World War Two, including those of Gwyn Thomas, Vernon Watkins, and Dylan Thomas, whose most famous work Under Milk Wood was first broadcast in 1954. Thomas was one of the most notable and popular Welsh writers of the 20th century and one of the most innovative poets of his time. Gwyn Thomas became the voice of the English-speaking Welsh valleys with his humorous take on grim lives. The attitude of the post-war generation of Welsh writers in English towards Wales differs from the previous generation, in that they were more sympathetic to Welsh nationalism and to the Welsh language. The change can be linked to the nationalist fervour generated by Saunders Lewis and the burning of the Bombing School on the Lleyn Peninsula in 1936, along with a sense of crisis generated by World War II. In poetry R. S. Thomas (1913–2000) was the most important figure throughout the second half of the twentieth century. While he "did not learn the Welsh language until he was 30 and wrote all his poems in English", he wanted the Welsh language to be made the first language of Wales, and the official policy of bilingualism abolished. The major novelist in the second half of the twentieth century was Emyr Humphreys (born 1919), who during his long writing career published over twenty novels, which surveys the political and cultural history of twentieth-century Wales. Another novelist of the post-Second-World-War era was Raymond Williams (1921–88). Born near Abergavenny, Williams continued the earlier tradition of writing from a left-wing perspective on the Welsh industrial scene in his trilogy "Border Country" (1960), "Second Generation" (1964), and "The Fight for Manod" (1979). He also enjoyed a reputation as a cultural historian. The National Museum [of] Wales was founded by royal charter in 1907 and is now a Welsh Government sponsored body. The National Museum is made up of seven sites across the country, including the National Museum Cardiff, St Fagans National History Museum and Big Pit National Coal Museum. In April 2001, the attractions attached to the National Museum were granted free entry by the Assembly, and this action saw the visitor numbers to the sites increase during 2001–2002 by 87.8 per cent to 1,430,428. Aberystwyth is home to the National Library of Wales, which houses some of the most important collections in Wales, including the Sir John Williams Collection and the Shirburn Castle collection. As well as its printed collection the Library holds important Welsh art collections including portraits and photographs, ephemera such as postcards, posters and Ordnance Survey maps. Many works of Celtic art have been found in Wales. In the Early Medieval period, the Celtic Christianity of Wales was part of the Insular art of the British Isles. A number of illuminated manuscripts from Wales survive, of which the 8th-century Hereford Gospels and Lichfield Gospels are the most notable. 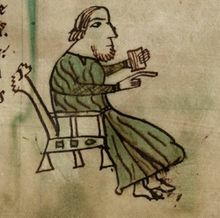 The 11th-century Ricemarch Psalter (now in Dublin) is certainly Welsh, made in St David's, and shows a late Insular style with unusual Viking influence. The best of the few Welsh artists of the 16th–18th centuries tended to leave the country to work, many of them moving to London or Italy. Richard Wilson (1714–82) is arguably the first major British landscapist. Although more notable for his Italian scenes, he painted several Welsh scenes on visits from London. By the late 18th century, the popularity of landscape art grew and clients were found in the larger Welsh towns, allowing more Welsh artists to stay in their homeland. Artists from outside Wales were also drawn to paint Welsh scenery, at first because of the Celtic Revival. Then in the early 19th century, the Napoleonic Wars preventing the Grand Tour to continental Europe, travel through Wales came to be considered more accessible. An Act of Parliament in 1857 provided for the establishment of a number of art schools throughout the United Kingdom and the Cardiff School of Art opened in 1865. Graduates still very often had to leave Wales to work, but Betws-y-Coed became a popular centre for artists and its artists' colony helped form the Royal Cambrian Academy of Art in 1881. The sculptor Sir William Goscombe John made many works for Welsh commissions, although he had settled in London. Christopher Williams, whose subjects were mostly resolutely Welsh, was also based in London. Thomas E. Stephens and Andrew Vicari had very successful careers as portraitists based respectively in the United States and France. Sir Frank Brangwyn was Welsh by origin but spent little time in Wales. Many Welsh painters gravitated towards the art capitals of Europe. Augustus John and his sister Gwen John lived mostly in London and Paris. However, the landscapists Sir Kyffin Williams and Peter Prendergast lived in Wales for most of their lives, while remaining in touch with the wider art world. Ceri Richards was very engaged in the Welsh art scene as a teacher in Cardiff and even after moving to London. He was a figurative painter in international styles including Surrealism. Various artists have moved to Wales, including Eric Gill, the London-Welshman David Jones and the sculptor Jonah Jones. The Kardomah Gang was an intellectual circle centred on the poet Dylan Thomas and poet and artist Vernon Watkins in Swansea, which also included the painter Alfred Janes. South Wales had several notable potteries, one of the first important sites being the Ewenny Pottery in Bridgend, which began producing earthenware in the 17th century. In the 18th and 19th centuries, with more scientific methods becoming available more refined ceramics were produced led by the Cambrian Pottery (1764–1870, also known as "Swansea pottery") and later Nantgarw Pottery near Cardiff, which was in operation from 1813 to 1822 making fine porcelain and then utilitarian pottery until 1920. Portmeirion Pottery, founded in 1960 by Susan Williams-Ellis, daughter of Clough Williams-Ellis, creator of the Italianate village of Portmeirion, Gwynedd, is based in Stoke-on-Trent, England. The Flag of Wales incorporates the red dragon (Y Ddraig Goch) of Prince Cadwalader along with the Tudor colours of green and white. It was used by Henry VII at the Battle of Bosworth in 1485, after which it was carried in state to St Paul's Cathedral. The red dragon was then included in the Tudor royal arms to signify their Welsh descent. It was officially recognised as the Welsh national flag in 1959. On its creation the Union Jack incorporated the flags of the kingdoms of Scotland, of Ireland and the Cross of St. George which then represented the Kingdom of England and Wales. The combined flag for both England and Wales arose from the Laws in Wales Act of 1535 which annexed Wales to England. The daffodil and the leek are both symbols of Wales. The origins of the leek can be traced to the 16th century, while the daffodil became popular in the 19th century, encouraged by David Lloyd George. This is attributed to confusion (or association) between the Welsh for leek, cenhinen, and that for daffodil, cenhinen Bedr or St. Peter's leek. A report in 1916 gave preference to the leek, which has appeared on British pound coins. The red kite is a national symbol of Welsh wildlife. 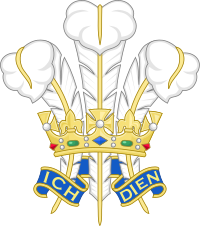 The Prince of Wales' heraldic badge is also sometimes used to symbolise Wales. The badge, known as the Prince of Wales's feathers, consists of three white feathers emerging from a gold coronet. A ribbon below the coronet bears the German motto Ich dien (I serve). Several Welsh representative teams, including the Welsh rugby union, and Welsh regiments in the British Army (the Royal Welsh, for example) use the badge or a stylised version of it. There have been attempts made to curtail the use of the emblem for commercial purposes and restrict its use to those authorised by the Prince of Wales. "Hen Wlad Fy Nhadau" (English: Land of My Fathers) is the National Anthem of Wales, and is played at events such as football or rugby matches involving the Wales national team as well as the opening of the Welsh Assembly and other official occasions. "God Save the Queen", the national anthem of the United Kingdom, is sometimes played alongside Hen Wlad fy Nhadau during official events with a royal connection. More than 50 national governing bodies regulate and organise their sports in Wales. Most of those involved in competitive sports select, organise and manage individuals or teams to represent their country at international events or fixtures against other countries. Wales is represented at major world sporting events such as the FIFA World Cup, Rugby World Cup, Rugby League World Cup and the Commonwealth Games. At the Olympic Games, Welsh athletes compete alongside those of Scotland, England and Northern Ireland as part of a Great Britain team. Although football has traditionally been the more popular sport in north Wales, rugby union is seen as a symbol of Welsh identity and an expression of national consciousness. The Wales national rugby union team takes part in the annual Six Nations Championship and has also competed in every Rugby World Cup, hosting the tournament in 1999. The five professional sides that replaced the traditional club sides in major competitions in 2003 were replaced in 2004 by the four regions: Cardiff Blues, Dragons, Ospreys and Scarlets. The Welsh regional teams play in the Pro14, the Anglo-Welsh Cup, the European Rugby Champions Cup and the European Rugby Challenge Cup. Wales has had its own football league, the Welsh Premier League, since 1992. For historical reasons, six Welsh clubs play in the English football league system; Cardiff City, Swansea City, Newport County, Wrexham, Colwyn Bay and Merthyr Town. Famous Welsh players over the years include John Charles, John Toshack, Gary Speed, Ian Rush, Ryan Giggs and Gareth Bale. At UEFA Euro 2016, the Wales national team achieved their best ever finish, reaching the semi-finals where they were beaten by eventual champions Portugal. Rugby league in Wales dates back to 1907. Currently two professional clubs, the South Wales Ironmen (based in Merthyr Tydfil) and the North Wales Crusaders (based in Wrexham) compete in the Rugby Football League's League 1 competition. The Crusaders competed in the top level Super League competition from 2009–2011. A professional Welsh League existed from 1908 to 1910. In international cricket, Wales and England field a single representative team, administered by the England and Wales Cricket Board (ECB), called the England cricket team, or simply 'England'. Occasionally, a separate Wales team play limited-overs competitions. Glamorgan County Cricket Club is the only Welsh participant in the England and Wales County Championship. Wales has produced several world-class participants of individual and team sports including snooker players Ray Reardon, Terry Griffiths, Mark Williams and Matthew Stevens. Track athletes who have made a mark on the world stage, including the 110-metre hurdler Colin Jackson who is a former world record holder and the winner of numerous Olympic, World and European medals as well as Tanni Grey-Thompson who has won 11 Paralympic gold medals. Cyclist Nicole Cooke won gold medals at the Commonwealth, Olympic and World championships; Geraint Thomas won the 2018 Tour de France. Wales also has a tradition of producing world-class boxers. Joe Calzaghe was WBO world super-middleweight champion and then won the WBA, WBC and Ring Magazine super middleweight and Ring Magazine light-heavyweight titles. Other former boxing world champions include Enzo Maccarinelli, Freddie Welsh, Howard Winstone, Percy Jones, Jimmy Wilde, Steve Robinson and Robbie Regan. Tommy Farr, the "Tonypandy Terror", came close to defeating world heavyweight champion Joe Louis at the height of his fame in 1937. Wales has hosted several international sporting events. These include the 1958 Commonwealth Games, the 1999 Rugby World Cup, the 2010 Ryder Cup and the 2017 UEFA Champions League Final. All Welsh television broadcasts are digital. The last of the analogue transmitters ceased broadcasts in April 2010, and Wales became the UK's first digital nation. Cardiff is home to the television output of Wales. BBC Cymru Wales is the national broadcaster. Based in Llandaff, Cardiff, it produces Welsh-oriented English and Welsh-language television for BBC One Wales, BBC TWO Wales and S4C channels. BBC Cymru Wales has also produced programmes, such as Life on Mars, Doctor Who and Torchwood, shown worldwide. ITV the UK's main commercial broadcaster has a Welsh-oriented service branded as ITV Cymru Wales, whose studios are in Culverhouse Cross, Cardiff. S4C, based in Llanishen, Cardiff, first broadcast on 1 November 1982. Its output was mostly Welsh-language at peak hours but shared English-language content with Channel 4 at other times. Since the digital switchover in April 2010, the channel has broadcast exclusively in Welsh. BBC Cymru Wales provide S4C with ten hours of programming per week. Their remaining output is commissioned from ITV and independent producers. 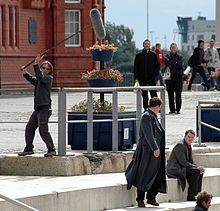 A number of BBC productions, such as Doctor Who and Torchwood, have been filmed in Wales. BBC Cymru Wales is Wales' only national radio broadcaster. BBC Radio Wales is their English-language radio service, broadcasting throughout Wales in English. BBC Radio Cymru is their Welsh-language radio service, broadcasting throughout Wales in Welsh. A number of independent radio stations broadcast to the Welsh regions, predominantly in English. Several regional radio stations broadcast in Welsh: output ranges from two, two-minute news bulletins each weekday (Radio Maldwyn), through over 14 hours of Welsh-language programmes weekly (Swansea Sound), to essentially bilingual stations offering between 37 and 44 per cent of programme content (Heart Cymru (formerly Champion 103) and Radio Ceredigion respectively). Most of the newspapers sold and read in Wales are national newspapers available throughout Britain, unlike in Scotland where many newspapers have rebranded into Scottish-based titles. The Western Mail is Wales' only national daily newspaper. Wales-based regional daily newspapers include: Daily Post (which covers north Wales); South Wales Evening Post (Swansea); South Wales Echo (Cardiff); and South Wales Argus (Newport). Y Cymro is a Welsh-language newspaper, published weekly. Wales on Sunday is the only Welsh Sunday newspaper to cover the whole of Wales. The Welsh Books Council (WBC) is the Welsh Government funded body tasked with promoting Welsh literature. The WBC provides publishing grants for qualifying English- and Welsh-language publications. Around 600–650 books are published each year, by some of the dozens of Welsh publishers. Wales' main publishing houses include Gomer Press, Gwasg Carreg Gwalch, Honno, the University of Wales Press and Y Lolfa. Magazines published in Welsh and English cover general and specialist subjects. Cambria, a Welsh affairs magazine published bi-monthly in English, has subscribers in over 30 countries. Titles published quarterly in English include Planet and Poetry Wales. Welsh-language magazines include the current affairs titles Golwg (View) (published weekly) and Barn (Opinion) (monthly). Among the specialist magazines, Y Wawr (The Dawn) is published quarterly by Merched y Wawr, the national organisation for women. Y Traethodydd (The Essayist), a quarterly publication by The Presbyterian Church of Wales, first appeared in 1845; the oldest Welsh publication still in print. About 78% of the land surface of Wales is given over to agricultural use. However, very little of this is arable land; the vast majority consists of permanent grass pasture or rough grazing for herd animals such as sheep and cows. Although both beef and dairy cattle are raised widely, especially in Carmarthenshire and Pembrokeshire, Wales is more well known for its sheep farming and thus lamb is the meat traditionally associated with Welsh cooking. 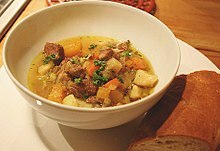 Traditional dishes include laverbread (made from Porphyra umbilicalis, an edible seaweed); bara brith (fruit bread); cawl (a lamb stew); cawl cennin (leek soup); Welsh cakes; and Welsh lamb. Cockles are sometimes served as a traditional breakfast with bacon and laverbread. Although Wales has its own traditional food and has absorbed much of the cuisine of England, Welsh diets now owe more to the countries of India, China and the United States. Chicken tikka masala is the country's favourite dish while hamburgers and Chinese food outsell fish and chips as a takeaway. Wales is often referred to as "the land of song", and is notable for its harpists, male choirs, and solo artists. 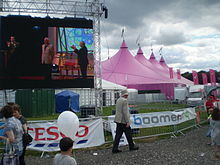 The principal Welsh festival of music and poetry is the annual National Eisteddfod. The Llangollen International Eisteddfod echoes the National Eisteddfod but provides an opportunity for the singers and musicians of the world to perform. Traditional music and dance in Wales is supported by a myriad of societies. The Welsh Folk Song Society has published a number of collections of songs and tunes. Traditional instruments of Wales include telyn deires (triple harp), fiddle, crwth (bowed lyre), pibgorn (hornpipe) and other instruments. The Cerdd Dant Society promotes its specific singing art primarily through an annual one-day festival. The BBC National Orchestra of Wales performs in Wales and internationally. The Welsh National Opera is based at the Wales Millennium Centre in Cardiff Bay, while the National Youth Orchestra of Wales was the first of its type in the world. Wales has a tradition of producing notable singers, including Sir Geraint Evans, Dame Gwyneth Jones, Dame Anne Evans, Dame Margaret Price, Sir Tom Jones, Bonnie Tyler, Sir Bryn Terfel, Mary Hopkin, Charlotte Church, Katherine Jenkins, Meic Stevens, Dame Shirley Bassey, Marina and the Diamonds and Duffy. Popular bands that emerged from Wales include the Beatles-nurtured power pop group Badfinger in the 1960s, Man and Budgie in the 1970s and the Alarm in the 1980s. Many groups emerged during the 1990s, led by Manic Street Preachers, followed by the likes of the Stereophonics and Feeder; notable during this period were Catatonia, Super Furry Animals, and Gorky's Zygotic Mynci who gained popular success as dual-language artists. Recently successful Welsh bands include Lostprophets, Bullet for My Valentine, Funeral for a Friend and Kids in Glass Houses. The Welsh traditional and folk music scene is in resurgence with performers and bands such as Carreg Lafar, Fernhill, Siân James and the Hennessys. Male voice choirs emerged in the 19th century and continue today. Originally these choirs where formed as the tenor and bass sections of chapel choirs, and embraced the popular secular hymns of the day. Many of the historic choirs survive in modern Wales, singing a mixture of traditional and popular songs. Anthony Hopkins' portrayal of Hannibal Lecter was named the number-one villain in cinema history by the AFI. The earliest surviving Welsh plays are two medieval miracle plays, Y Tri Brenin o Gwlen ("The three Kings from Cologne") and Y Dioddefaint a'r Atgyfodiad ("The Passion and the Resurrection"). A recognised Welsh tradition of theatre emerged during the 18th century, in the form of an interlude, a metrical play performed at fairs and markets. The larger Welsh towns began building theatres during the 19th century, and attracted the likes of James Sheridan Knowles and William Charles Macready to Wales. Along with the playhouses, there existed mobile companies at visiting fairs, though from 1912 most of these travelling theatres settled, purchasing theatres to perform in. Drama in the early 20th century thrived, but the country failed to produce a Welsh National Theatre company. After the Second World War the substantial number of amateur companies that had existed before the outbreak of hostilities reduced by two-thirds. The increasing competition from television in the 1950s and 1960s led to a need for greater professionalism in the theatre. As a result, plays by Emlyn Williams and Alun Owen and others were staged, while Welsh actors, including Richard Burton, Rachel Roberts, Donald Houston and Stanley Baker, were establishing themselves as artistic talents. Anthony Hopkins was an alumnus of the Royal Welsh College of Music & Drama and has since starred in Hollywood films. John Rhys-Davies is another well-known actor, famous for his portrayal of Gimli in The Lord of the Rings trilogy and the charismatic Arab excavator Sallah in the Indiana Jones films. Other Welsh actors to have crossed the Atlantic more recently include Ioan Gruffudd, Rhys Ifans, Matthew Rhys, Michael Sheen and Catherine Zeta-Jones. Wales has also produced well known comedians including Rob Brydon, Tommy Cooper, Rhod Gilbert, Terry Jones, Harry Secombe and Paul Whitehouse. Dancing is a popular pastime in Wales; traditional dances include folk dancing and clog dancing. The first mention of dancing in Wales is in a 12th-century account by Giraldus Cambrensis, but by the 19th century traditional dance had all but died out; this is attributed to the influence of Nonconformists and their belief that any physical diversion was worthless and satanic, especially mixed dancing. These ancient dances, orally passed down, were almost single-handedly rescued by Lois Blake (1890–1974) who recorded them in numerous instruction pamphlets, recording both steps and music. In a similar vein, clog dancing was preserved and developed by the likes of Howel Wood (1882–1967) who perpetuated the art at local and national stages. Clog dancing, traditionally a male dominated art, is now a common part of eisteddfodau. In 2010, a 30-year traditional dance festival held in Caernarvon came to an end due to a lack of participants, though clog dancing has seen a revival in the 21st century. The Welsh Folk Dance Society was founded in 1949; it supports a network of national amateur dance teams and publishes support material. Contemporary dance grew out of Cardiff in the 1970s; one of the earliest companies, Moving Being, came from London to Cardiff in 1973. Diversions was formed in 1983, eventually becoming the National Dance Company Wales, now the resident company at the Wales Millennium Centre. Conversely, Wales does not have its own national ballet company. As well as celebrating many of the traditional religious festivals of Great Britain, such as Easter and Christmas, Wales has its own unique celebratory days. An early festivity was Mabsant when local parishes would celebrate the patron saint of their local church. This celebration died out in the 19th century, to be replaced by Saint David's Day, which is celebrated on 1 March throughout Wales, and by Welsh expats around the world. Commemorating the patron saint of friendship and love, Dydd Santes Dwynwen's popularity has been increasing recently. It is celebrated on 25 January in a similar way to St Valentine's Day: by exchanging cards and by holding parties and concerts. Calan Gaeaf, associated with the supernatural and the dead, is observed on 1 November (All Saints Day). It has largely been replaced by Hallowe'en. Other festivities include Calan Mai (May Day), celebrating the beginning of summer; Calan Awst (Lammas Day); and Gŵyl Fair y Canhwyllau (Candlemas Day). ^ "Cymru am byth! The meaning behind the Welsh motto". WalesOnline. 6 February 2015. Retrieved 22 March 2016. ^ "Statute of Rhuddlan". Oxford Reference. Retrieved 26 July 2014. ^ "Laws in Wales Act 1535 (repealed 21.12.1993)". legislation.gov.uk. Retrieved 26 July 2014. ^ "Government of Wales Act 1998". legislation.gov.uk. Retrieved 26 July 2014. ^ "Mid year estimates of the population". gov.wales. Retrieved 7 July 2018. ^ a b "The Countries of the UK". statistics.gov.uk. Retrieved 10 October 2008. ^ (in French) Albert Henry, Histoire des mots Wallons et Wallonie, Institut Jules Destrée, Coll. "Notre histoire", Mont-sur-Marchienne, 1990, 3rd ed. (1st ed. 1965), footnote 13 p. 86. Henry wrote the same about Wallachia. ^ Tolkien, J. R. R. (1963). Angles and Britons: O'Donnell Lectures. Cardiff: University of Wales Press. English and Welsh, an O'Donnell Lecture delivered at Oxford on 21 October 1955. ^ Gilleland, Michael (12 December 2007). "Laudator Temporis Acti: More on the Etymology of Walden". Laudator Temporis Acti website. Retrieved 29 October 2008. ^ Rollason, David (2003). "Origins of a People". Northumbria, 500–1100. Cambridge: Cambridge University Press. p. 60. ISBN 978-0-521-04102-7. ^ Lloyd, John Edward (1911). "A History of Wales from the Earliest Times to the Edwardian Conquest (Note to Chapter VI, the Name "Cymry")". I (Second ed.). London: Longmans, Green, and Co. (published 1912): 191–192. ^ Phillimore, Egerton (1891). "Note (a) to The Settlement of Brittany". In Phillimore, Egerton (ed.). Y Cymmrodor. XI. London: Honourable Society of Cymmrodorion (published 1892). pp. 97–101. ^ Davies (1994) p. 71; the poem contains the line: 'Ar wynep Kymry Cadwallawn was'. ^ Pollard, Joshua (2001). "Wales' Hidden History, Hunter-Gatherer Communities in Wales: The Neolithic". In Morgan, Prys; Aldhouse-Green, Stephen (eds.). History of Wales, 25,000 BC AD 2000. Stroud, Gloucestershire: Tempus Publishing. pp. 13–25. ISBN 978-0-7524-1983-1. ^ Evans, Edith; Lewis, Richard (2003). "The Prehistoric Funerary and Ritual Monument Survey of Glamorgan and Gwent: Overviews. A Report for Cadw by Edith Evans BA PhD MIFA and Richard Lewis BA" (PDF). Proceedings of the Prehistoric Society. 64: 4. Retrieved 30 September 2009. ^ "Overview: From Neolithic to Bronze Age, 8000–800 BC (Page 1 of 6)". BBC History website. BBC. 5 September 2006. Retrieved 5 August 2008. ^ "GGAT 72 Overviews" (PDF). A Report for Cadw by Edith Evans BA PhD MIFA and Richard Lewis BA. Glamorgan-Gwent Archaeological Trust. 2003. p. 47. Retrieved 30 December 2008. ^ "Stones of Wales – Pentre Ifan Dolmen". Stone Pages website. Paola Arosio/Diego Meozzi. 2003. Retrieved 17 November 2008. ^ "Stones of Wales – Bryn Celli Ddu Burial chamber". Stone Pages website. Paola Arosio/Diego Meozzi. 2003. Retrieved 17 November 2008. ^ "Parc le Breos Burial Chamber; Parc CWM Long Cairn". The Royal Commission on the Ancient and Historical Monuments of Wales website. Royal Commission on the Ancient and Historical Monuments of Wales. 2006. Retrieved 24 October 2008. ^ "Themes Prehistoric Wales: The Stone Age". BBC Cymru Wales website. BBC Cymru Wales. 2008. Retrieved 24 October 2008. ^ "O'Donnell Lecture 2008 Appendix" (PDF). 2008. Retrieved 2 October 2010. ^ Koch, John T. (2009). "A CASE FOR TARTESSIAN AS A CELTIC LANGUAGE" (PDF). Acta Palaeohispanica X Palaeohispanica. 9. ^ Jones, Barri; Mattingly, David (1990). "The Development of the Provinces". An Atlas of Roman Britain. Cambridge: Blackwell Publishers (published 2007). p. 151. ISBN 978-1-84217-067-0. ^ "RCAHMW Coflein: Caerwent Roman City; Venta Silurum". Retrieved 23 February 2019. ^ Jones, Barri; Mattingly, David (1990). "The Development of the Provinces". An Atlas of Roman Britain. Cambridge: Blackwell Publishers (published 2007). p. 154. ISBN 978-1-84217-067-0. ^ a b Jones, Barri; Mattingly, David (1990). "The Economy". An Atlas of Roman Britain. Cambridge: Blackwell Publishers (published 2007). pp. 179–196. ISBN 978-1-84217-067-0. ^ Frere, Sheppard Sunderland (1987). "The End of Roman Britain". Britannia: A History of Roman Britain (3rd, revised ed.). London: Routledge & Kegan Paul. p. 354. ISBN 978-0-7102-1215-3. ^ Giles, John Allen, ed. (1841). "The Works of Gildas, The History, Ch. 14". The Works of Gildas and Nennius. London: James Bohn. p. 13. ^ Phillimore, Egerton, ed. (1887). "Pedigrees from Jesus College MS. 20". Y Cymmrodor. VIII. Honourable Society of Cymmrodorion. pp. 83–92. ^ Phillimore, Egerton (1888). "The Annales Cambriae and Old Welsh Genealogies, from Harleian MS. 3859". In Phillimore, Egerton (ed.). Y Cymmrodor. IX. Honourable Society of Cymmrodorion. pp. 141–183. ^ Ravilious, Kate (21 July 2006). "Ancient Britain Had Apartheid-Like Society, Study Suggests". National Geographic News. Retrieved 9 September 2010. ^ Myres, Natalie; Rootsi, Siiri; Lin, Alice A; Järve, Mari; King, Roy J; Kutuev, Ildus; Cabrera, Vicente M; Khusnutdinova, Elza K; Pshenichnov, Andrey; Yunusbayev, Bayazit; Balanovsky, Oleg; Balanovska, Elena; Rudan, Pavao; Baldovic, Marian; Herrera, Rene J; Chiaroni, Jacques; Di Cristofaro, Julie; Villems, Richard; Kivisild, Toomas; Underhill, Peter A (2010). "A major Y-chromosome haplogroup R1b Holocene effect in Central and Western Europe – see discussion results at end of article, the distribution maps and the supplementary tables". European Journal of Human Genetics. 19 (1): 95–101. doi:10.1038/ejhg.2010.146. PMC 3039512. PMID 20736979. ^ Charles-Edwards, T M (2001). "Wales and Mercia, 613–918". In Brown, Michelle P; Farr, Carol Ann (eds.). Mercia: an Anglo-Saxon kingdom in Europe. Leicester University Press. p. 104. ISBN 978-0-7185-0231-7. Retrieved 27 November 2010. ^ Hill, David (2001). "Wales and Mercia, 613–918". In Brown, Michelle P; Farr, Carol Ann (eds.). Mercia: an Anglo-Saxon kingdom in Europe. Leicester University Press. p. 176. ISBN 978-0-7185-0231-7. Retrieved 27 November 2010. ^ Lieberman, Max (2010). The Medieval March of Wales: The Creation and Perception of a Frontier, 1066–1283. Cambridge: Cambridge University Press. p. 6. ISBN 978-0-521-76978-5. Retrieved 4 October 2010. ^ "Chapter 6: The Coming of the Normans". BBC Cymru Wales website. BBC Cymru Wales. 2008. Retrieved 4 October 2010. ^ "Tribute to lost Welsh princess". BBC News. 12 June 2000. Retrieved 5 March 2007. ^ Davies, Age of Conquest, pp. 357, 364. ^ "Wales under the Tudors". BBC. 5 November 2009. Retrieved 21 September 2010. ^ Lieberman, Max (2010). The Medieval March of Wales: The Creation and Perception of a Frontier, 1066–1283. Cambridge: Cambridge University Press. p. 4. ISBN 978-0-521-76978-5. Retrieved 4 October 2010. ^ "Wales – the first industrial nation of the World". Amgueddfa Cymru – National Museum Wales. 5 October 2008. Archived from the original on 3 October 2011. Retrieved 9 September 2010. ^ John, Arthur H. (1980). Glamorgan County History, Volume V, Industrial Glamorgan from 1700 to 1970. Cardiff: University of Wales Press. p. 183. ^ "David Lloyd George (1863–1945)". BBC Cymru Wales website. BBC Cymru Wales. Retrieved 26 September 2010. ^ Morgan, Kenneth O. (1982). Rebirth of a Nation: Wales 1880–1980. Oxford: Oxford University Press. pp. 208–210. ISBN 978-0-19-821760-2. ^ "Disestablishment, Cymru Fydd and Plaid Cymru". National Library of Wales. llgc.org.uk. Archived from the original on 6 December 2010. Retrieved 25 November 2010. ^ "Cymdeithas yr Iaith Gymraeg's first protest, 1963". Gathering the Jewels. gtj.org.uk. Archived from the original on 18 January 2012. Retrieved 25 November 2010. ^ "Wales on Air: The drowning of Tryweryn and Capel Celyn". BBc.co.uk. BBC. Archived from the original on 6 December 2009. Retrieved 25 November 2010. ^ "Flooding Apology". BBC website. BBC. 19 October 2005. Retrieved 18 October 2008. ^ Clews, Roy (1980). To Dream of Freedom – The story of MAC and the Free Wales Army. Y Lolfa Cyf., Talybont. pp. 15, 21 & 26–31. ISBN 978-0-86243-586-8. ^ "Our history – Clywedog Dam, Wales −1967". Halcrow website. Halcrow Group Ltd. 2011. Archived from the original on 30 December 2011. Retrieved 8 January 2012. ^ Clews, Roy (1980). To Dream of Freedom – The story of MAC and the Free Wales Army. Y Lolfa Cyf., Talybont. pp. 22, 59, 60 & 216. ISBN 978-0-86243-586-8. ^ Gwynfor, Evans (2000). The Fight for Welsh Freedom. Y Lolfa Cyf., Talybont. p. 152. ISBN 978-0-86243-515-8. ^ "The Constitution Series: 1 – Wales in the United Kingdom" (PDF). National Assembly for Wales. July 2011. Archived from the original (PDF) on 20 April 2016. Retrieved 6 April 2016. ^ a b Powys, Betsan (12 January 2010). "The long Welsh walk to devolution". BBC News website. BBC. Retrieved 26 September 2010. ^ "Countries within a country". 10 Downing Street website. 10 Downing Street. 10 January 2003. Archived from the original on 9 September 2008. Retrieved 5 November 2010. The United Kingdom is made up of four countries: England, Scotland, Wales and Northern Ireland. ^ "UN report causes stir with Wales dubbed 'Principality'". WalesOnline website. Media Wales Ltd. 3 July 2010. Retrieved 25 July 2010. ... the Assembly's Counsel General, John Griffiths, [said]: "I agree that, in relation to Wales, Principality is a misnomer and that Wales should properly be referred to as a country. ^ a b "Wales.com FAQs". Wales.com website. Welsh Government. 2008. Retrieved 24 August 2015. ^ Jones, Ciaran (9 June 2017). "These are the 40 MPs who have been elected across Wales". Wales Online. ^ "Alun Cairns Welsh Secretary after Stephen Crabb's promotion". BBC News website. BBC. 19 March 2016. Retrieved 25 July 2016. ^ "UK Parliament -Parliament's role". United Kingdom Parliament website. United Kingdom Parliament. 29 June 2009. Retrieved 1 September 2009. ^ "The role of the Secretary of State for Wales" (PDF). Welsh Government website. Welsh Government. 2005. Archived from the original (PDF) on 3 September 2011. Retrieved 28 September 2010. ^ "How the Assembly is elected". National Assembly for Wales website. National Assembly for Wales. 2010. Archived from the original on 9 January 2009. Retrieved 6 October 2010. ^ Birrell, Derek (2012). Comparing Devolved Government. London, United Kingdom: Palgrave Macmillan. p. 45. ISBN 978-0-230-38978-6. ^ "Plaid gamble pays off in Llanelli". BBC News website. BBC. 4 May 2007. Retrieved 6 October 2010. ^ "Labour-Plaid coalition is sealed". BBC News website. BBC. 7 July 2007. Retrieved 29 September 2010. ^ "Carwyn Jones officially nominated as First Minister". WalesOnline website. Media Wales Ltd. 9 December 2009. Retrieved 9 December 2009. ^ "Wales | Details of Labour-Plaid Agreement". BBC News website. BBC. 27 June 2007. Retrieved 19 June 2010. ^ "Welsh Assembly election 2016 results". BBC News. Retrieved 19 August 2016. ^ "Welsh Assembly: Deadlock in vote for first minister". BBC News. Retrieved 19 August 2016. ^ "Welsh Government includes Lib Dem Williams at education". BBC News. Retrieved 19 August 2016. ^ "Nathan Gill leaves UKIP assembly group to sit as independent". BBC News. Retrieved 19 August 2016. ^ "Ex-leader Lord Elis-Thomas left party over Labour stance". BBC News. 15 October 2016. Retrieved 15 October 2016. ^ Servini, Nick (6 April 2017). "UKIP's Mark Reckless to join Conservatives in assembly". BBC News. Retrieved 6 April 2017. ^ "Making laws for Wales". National Assembly for Wales website. National Assembly for Wales. 2010. Archived from the original on 22 September 2010. Retrieved 6 October 2010. ^ "Schedule 5 to the Government of Wales Act 2006 (as amended)". National Assembly for Wales website. National Assembly for Wales. 2006. Archived from the original on 20 November 2010. Retrieved 6 October 2010. ^ "Government of Wales Act 1998". The National Archives website. HM Government. 2010. Retrieved 6 October 2010. ^ "Government of Wales Act 2006". The National Archives website. HM Government. 2010. Retrieved 6 October 2010. ^ "Wales says Yes in referendum vote". BBC. 4 March 2011. Retrieved 3 November 2011. ^ "Your Members in the European Parliament". European Parliament. Archived from the original on 23 April 2015. Retrieved 8 June 2015. ^ "USA". wales.com. Archived from the original on 28 August 2017. Retrieved 23 September 2017. ^ "Congressional Friends of Wales Caucus Welcomes First Minister Carwyn Jones | Congressman Morgan Griffith". Morgangriffith.house.gov. Retrieved 23 September 2017. ^ "Local Authorities". Welsh Government. Archived from the original on 30 May 2014. Retrieved 9 September 2010. ^ a b "History and Development of the Welsh Language in the Courts". Her Majesty's Courts Service website. Her Majesty's Courts Service. 11 June 2007. Archived from the original on 6 June 2011. Retrieved 7 October 2010. ^ "Two of the four Welsh police forces 'require improvement' in the way they prevent and investigate crime". ITV News. 18 February 2016. Retrieved 29 February 2016. ^ "MPs urge UK government to build north Wales prison". BBC News. 3 March 2010. Retrieved 31 December 2010. ^ HM Prison Service (21 September 2000). "Female Prisoners". hmprisonservice.gov.uk. Archived from the original on 6 February 2011. Retrieved 31 December 2010. ^ a b UK 2005 – The Official Yearbook of the United Kingdom of Great Britain and Northern Ireland (PDF). Office for National Statistics. 2004. pp. 2 & 30. ISBN 978-0-11-621738-7. Retrieved 10 February 2012. ^ "Geography: About Wales". Visit Wales website. Welsh Government. 2010. Retrieved 3 October 2010. ^ "Size of Wales project". Size of Wales. Archived from the original on 29 January 2012. Retrieved 10 February 2012. ^ "England and Wales". European Land Information Service. Archived from the original on 20 July 2011. Retrieved 2 October 2010. ^ "Celtic Sea". Parliamentary Debates (Hansard). 883. House of Commons. 16 December 1974. col. 317W. ^ "Limits of Oceans and Seas, 3rd edition + corrections" (PDF). International Hydrographic Organization. 1971. p. 42 [corrections to page 13]. Retrieved 12 November 2010. ^ Darkes, Giles (January 2008). "How long is the UK coastline?". The British Cartographic Society. Retrieved 6 October 2015. ^ Glancey, Jonathan (2 August 2009). "High tea: Mount Snowdon's magical mountaintop cafe". London: guardian.co.uk. Retrieved 28 September 2010. ^ "Mountain upgraded to 'super' status". WalesOnline website. Media Wales Ltd. 22 September 2010. Retrieved 30 September 2010. ^ "The Welsh 3000s Challenge". welsh3000s.co.uk. Retrieved 28 September 2010. ^ "Aran Fawddwy". snowdoniaguide.com. Retrieved 2 October 2010. ^ "Areas of Outstanding Natural Beauty". Welsh Government website. Welsh Government. Archived from the original on 25 June 2012. Retrieved 6 October 2010. ^ "Heritage Coasts". britainexpress.com. Retrieved 29 September 2010. ^ "Welsh beaches & coastline". www.wales.com. Retrieved 24 February 2018. ^ "Stormy Weather". BBC North West Wales website. BBC. 28 April 2006. Archived from the original on 26 January 2011. Retrieved 26 September 2010. ^ "In detail: The Sea Empress disaster". BBC News website. BBC. 2000. Retrieved 26 September 2010. ^ See Meic Stephens (ed. ), Companion to Welsh Literature. The doggerel verse was composed in English, probably for the benefit of visitors from across Offa's Dyke. ^ a b "Seven Wonders of Wales". Visit Flintshire. Archived from the original on 31 March 2016. Retrieved 3 April 2016. ^ "The Cambrian Period of the Paleozoic Era: 542 to 488 Million Years Ago". palaeos.com. 11 April 2002. Retrieved 2 October 2010. ^ Sedgwick, A. (1852). "On the classification and nomenclature of the Lower Paleozoic rocks of England and Wales". Q. J. Geol. Soc. Lond. 8 (1–2): 136–138. doi:10.1144/GSL.JGS.1852.008.01-02.20. ^ "The Silurian: The Silurian Period of the Paleozoic Era: 444 to 416 Mya". palaeos.com. 11 April 2002. Archived from the original on 9 March 2012. Retrieved 10 February 2012. ^ "The Ordovician: The Ordovician Period of the Paleozoic Era: 488 to 444 million years ago". palaeos.com. 11 April 2002. Archived from the original on 7 March 2012. Retrieved 10 February 2012. ^ a b c d e f "Met Office: Regional Climate: Wales". Met Office website. Met Office. 2010. Retrieved 26 September 2010. ^ Turner, Robert (26 July 2010). "Soggiest city in Britain pays high price for rain". Media Wales Ltd. Retrieved 26 September 2010. ^ "Met Office: Climate: change glossary". Met Office website. Met Office. 2010. Archived from the original on 25 January 2012. Retrieved 10 February 2012. ^ a b "Weather at Cardiff Airport (CWL):Weather and Climate in Cardiff Area, Wales, U". Airports guides website. TravelSmart Ltd. 2010. Retrieved 26 September 2010. ^ a b "Wales: climate". Met Office. Archived from the original on 13 January 2012. Retrieved 9 September 2010. ^ a b "Met Office:Regional Climate: Wales". Met Office website. Met Office. 2009. Archived from the original on 13 January 2012. Retrieved 6 October 2009. ^ "Digital Archive of Extreme UK Rainfall Events" (PDF). Hydro-GIS Ltd. Archived from the original (PDF) on 12 March 2012. Retrieved 2 October 2010. ^ Clark, Ross (28 October 2006). "The wetter, the better". London: The Independent. Retrieved 2 September 2009. ^ Green, Mick (2007). "Wales Ring Ouzel Survey 2006" (PDF). Ecology Matters Ltd. Archived from the original (PDF) on 11 March 2012. Retrieved 6 September 2010. ^ "Black ravens return to the roost". BBC. 24 January 2006. Retrieved 6 September 2010. ^ "Red kite voted Wales' Favourite Bird". Royal Society for the Protection of Birds. 11 October 2007. Retrieved 6 September 2010. ^ "About Conwy". RSPB.org.uk. 16 April 2010. Retrieved 6 September 2010. ^ Vidal, John (13 November 2006). "Goats have roamed Snowdonia for 10,000 years; now they face secret cull". London: guardian.co.uk. Retrieved 14 August 2011. ^ Perring, E.H.; Walters, S.M., eds. (1990). Atlas of the British Flora. Melksham, Great Britain: BSBI. p. 43. ISBN 978-0-901158-19-2. ^ Day, Graham (2002). Making sense of Wales. Cardiff: University of Wales Press. p. 87. ISBN 978-0-7083-1771-6. ^ a b "Llywodraeth Cymru | Welsh Government". gov.wales. Retrieved 24 February 2018. ^ "South Wales coalfield timeline". University of Wales Swansea. 2002. Retrieved 11 September 2010. ^ "Coal Exchange to 'stock exchange'". BBC News website. BBC. 26 April 2007. Retrieved 11 October 2008. ^ "Coal and Shipping Metropolis of the World". Amgueddfa Cymru – National Museum Wales website. Amgueddfa Cymru – National Museum Wales. 18 April 2007. Archived from the original on 5 January 2009. Retrieved 11 October 2008. ^ a b Williams, Professor Phil (September 2003). The psychology of distance: Wales: one nation. Papurau Gregynog. 3. Cardiff: Institute of Welsh Affairs (published 2003). p. 31. ISBN 978-1-86057-066-7. ^ Massey, Glenn (August 2009). "Review of International Business Wales" (PDF). Welsh Government. p. 10. Archived from the original (PDF) on 4 December 2009. Retrieved 11 September 2010. ^ "A Review of Local Economic and Employment Development Policy Approaches in OECD Countries" (PDF). OECD Local Economic and Employment Development (LEED) Programme. OECD. p. 8. Archived from the original (PDF) on 22 February 2011. Retrieved 11 September 2010. ^ a b c "Wales A Vibrant Economy" (PDF). Welsh Government. 2005. pp. 12, 22, 40, 42. Archived from the original (PDF) on 13 February 2010. Retrieved 2 October 2010. ^ "Tourism hope over record 45 beach flags in Wales". BBC News website. BBC. 11 May 2010. Retrieved 7 September 2010. ^ "Tourism – Sector Overview Wales". GO Wales website. GO Wales. Archived from the original on 9 April 2010. Retrieved 7 September 2010. ^ "Welsh Government | Written – Wales – the world's first 'Fair Trade Nation'". Welsh Government website. Welsh Government. 6 June 2008. Archived from the original on 22 January 2010. Retrieved 19 June 2010. ^ Dr. Stamp, A.H. (1 June 2001). "The man who printed his own money". Country Quest Magazine. Retrieved 30 September 2010. ^ Carradice, Phil. "The collapse of the Welsh banks". BBC Cymru Wales website. BBC. Retrieved 30 September 2010. ^ "About the Bank". Bank of England website. Bank of England. 2010. Retrieved 30 September 2010. The Bank (of England) has had a monopoly on the issue of banknotes in England and Wales since the early 20th century. ^ "The Bank of England's Role in Regulating the Issue of Scottish and Northern Ireland Banknotes". Bank of England website. Bank of England. 2010. Retrieved 30 September 2010. ^ "Commercial Bank of Wales, Carmarthen Branch, Papers". Archives Wales. Archived from the original on 16 July 2011. Retrieved 8 September 2010. ^ "www.royalmint.gov.uk". Royal Mint website. Royal Mint. 2010. Archived from the original on 12 October 2010. Retrieved 26 September 2010. ^ "The New Designs Revealed". Royal Mint website. Royal Mint. 10 February 2012. Archived from the original on 22 May 2008. Retrieved 11 October 2008. ^ "Estimates of station usage" (Excel). 2011–12 report and data. Office of Rail Regulation. May 2013. Retrieved 3 October 2013. ^ "Business leaders back electric railway demand". WalesOnline.co.uk. 25 January 2011. Retrieved 7 June 2012. ^ "Britain's Transport Infrastructure, Rail Electrification" (PDF). Department for Transport. 2009. Archived from the original (PDF) on 8 April 2010. Retrieved 7 June 2012. ^ "Revived Swansea-Cork ferry service sets sail". BBC News website. BBC. 10 March 2010. Retrieved 19 June 2010. ^ "Swansea-Cork ferry: Fastnet Line to close service with loss of 78 jobs". BBC News website. BBC. 2 February 2012. Retrieved 15 April 2012. ^ "The Welsh language in 19th century education". BBC Cymru Wales history website. BBC Cymru Wales. 2010. Retrieved 24 November 2010. ^ Nash, Roy (1980). Schooling in rural societies. London: Methuen & Co. Ltd. p. 90. ISBN 978-0-416-73300-6. Retrieved 24 November 2010. ^ Baker, Colin (1992). Attitudes and language. Multilingual Matters. 83. Clevedon: Multilingual Matters. p. 99. ISBN 978-1-85359-142-6. Retrieved 24 November 2010. ^ Fitz, John (2001). Shimahara, N. Ken; Holowinsky, Ivan Z.; Tomlinson-Clarke, Saundra (eds.). Local identity and national systems: the case of Wales. Ethnicity, race, and nationality in education: a global perspective. Mahwah, New Jersey: Lawrence Erlbaum Associates, Inc. p. 248. ISBN 978-0-8058-3837-4. Retrieved 24 November 2010. ^ Jones, Megan. "Welsh-medium education and Welsh as a subject" (PDF). National Assembly for Wales. Retrieved 26 February 2018. ^ "Schools by local authority, region and type of school". statswales.gov.wales. Retrieved 24 February 2018. ^ "Pupils by local authority, region and age group". statswales.gov.wales. Retrieved 24 February 2018. ^ "Full-time equivalent teachers by local authority, region and category". Retrieved 24 February 2018. ^ "health in Wales – 1960s". NHS Wales website. NHS Wales. Retrieved 8 September 2010. ^ "NHS Wales – About Us". NHS Wales website. NHS Wales. Retrieved 8 September 2010. ^ a b "Edwina Hart MBE AM". Welsh Government website. Welsh Government. Archived from the original on 13 January 2012. Retrieved 12 September 2010. ^ "Welsh Health Survey 2009" (PDF). Welsh Government website. Welsh Government. Retrieved 26 September 2010. ^ Griffith, Hywel (21 October 2006). "Chronic condition of our health". BBC News website. BBC. Retrieved 26 September 2010. ^ "National Survey for Wales 2017-18: Population Health - Lifestyle" (PDF). Welsh Government website. Welsh Government. 27 June 2018. Retrieved 23 February 2019. ^ John Davies (1993). A History of Wales. pp. 258–59, 319. ISBN 9780141926339. ^ "200 Years of the Census in ... Wales: Census 2001" (PDF). Archived from the original (PDF) on 19 March 2009. ^ "Industrial Revolution". BBC. Retrieved 17 October 2009. ^ LSJ Services [Wales] Ltd. "Population therhondda.co.uk. Retrieved 9 May 2006". Therhondda.co.uk. Archived from the original on 20 May 2008. Retrieved 17 October 2009. ^ "BBC Wales – History – Themes – Italian immigration". BBC. Retrieved 17 October 2009. ^ "Socialist Unity – Debate & analysis for activists & trade unionists". ^ "2011 Census – Population and Household Estimates for Wales" (PDF). Office for National Statistics. March 2011. p. 6. Retrieved 13 December 2012. ^ "O2011 Census: Key Statistics for Wales, March 2011". Ons.gov.uk. March 2011. Retrieved 9 January 2016. ^ "O2011 Census: Key Statistics for Wales, March 2011". Ons.gov.uk. March 2011. Retrieved 15 January 2016. ^ "A Statistical Focus on Ethnicity in Wales" (PDF). National Assembly for Wales. 2004. p. 1. Archived from the original (PDF) on 14 December 2011. Retrieved 10 February 2012. ^ Turner, Robin (8 January 2004). "Poles immigrate to Welsh town by thousands". Western Mail. WalesOnline. Retrieved 25 November 2010. ^ Ford, Richard (12 October 2007). "Break out the golabki as Polish workers spread across map of Britain". The Times. London: TimesOnline. Retrieved 25 November 2010. ^ "Census results 'defy tickbox row'". BBC Online. Retrieved 23 February 2014. ^ "2011 Census: KS202EW National identity, unitary authorities in Wales (Excel sheet 126Kb)". Office for National Statistics. 11 December 2012. p. 3. Retrieved 28 September 2013. ^ "Nationalia – Two out of three inhabitants of Wales consider Welsh to be their national identity". Retrieved 7 October 2014. ^ "ONS, "Ethnicity and National Identity in England and Wales 2011", 2012, p.8" (PDF). ^ "2011 Census: KS201EW Ethnic group, local authorities in England and Wales". Office for National Statistics. Retrieved 28 February 2014. ^ "Use of the census of population to discern trends in the Welsh language: an aggregate analysis" (PDF). Office for National Statistics. 8 January 2004. Archived from the original (PDF) on 8 March 2012. Retrieved 10 February 2012. ^ "Profile of General Demographic Characteristics: 2000" (PDF). United States Census Bureau. July 2002. Retrieved 2 October 2010. ^ "Ethnic origins, 2006 counts, for Canada, provinces and territories – 20% sample data". Statistics Canada. 8 January 2004. Retrieved 19 June 2010. ^ "Total Fertility Rate and General Fertility Rate by year". Statswales.wales.gov.uk. Retrieved 17 July 2013. ^ "Live births by year, marriage, parity and registration type". Statswales.wales.gov.uk. Retrieved 17 July 2013. ^ "One in 10 Welsh babies have foreign-born mothers". BBC News. 31 August 2012. ^ Webber, Richard. "The Welsh diaspora: Analysis of the geography of Welsh names" (PDF). Welsh Government. p. 4. Archived from the original (PDF) on 3 June 2012. Retrieved 11 September 2010. ^ Reaney, P H; Wilson, R M (1997). A Dictionary of English Surnames (3rd ed.). Oxford: Oxford University Press. pp. 1ii. ISBN 978-0-19-860092-3. ^ "Who were the Celts? ... Rhagor". Amgueddfa Cymru – National Museum Wales website. Amgueddfa Cymru– National Museum Wales. 4 May 2007. Archived from the original on 5 February 2015. Retrieved 14 October 2009. ^ Official Languages Scheme, July 2013, Assembly Commission. Retrieved 20 September 2016. ^ Hill, Claire (2 October 2006). "Why butty rarely leaves Wales". WalesOnline website. Media Wales Ltd. Retrieved 15 November 2010. ^ "2011 Census, Key Statistics for Unitary Authorities in Wales". Office for National Statistics. 11 December 2012. Retrieved 11 December 2012. ^ "Census 2001: Main statistics about Welsh". Welsh Language Board. Archived from the original on 24 May 2011. Retrieved 30 September 2010. ^ "The Welsh Language Standards (No. 1) Regulations 2015". www.legislation.gov.uk. Retrieved 22 June 2017. ^ a b c d "Statistical bulletin: 2011 Census: Key Statistics for Wales, March 2011". Office for National Statistics. 11 December 2012. Retrieved 11 December 2012. ^ a b "Faith in Wales, Counting for Communities" (PDF). 2008. p. 21. Archived from the original (PDF) on 24 October 2013. Retrieved 6 September 2010. ^ "Glamorgan Archives, Glamorgan Presbyterian Church Marriage registers". Archives Wales. Archived from the original on 27 April 2016. Retrieved 9 September 2010. ^ "Catholic Encyclopedia: St. David". Newadvent.org. Retrieved 22 May 2015. ^ "Evan Roberts (1878–1951)". National Library of Wales. 2007. Retrieved 2 October 2010. ^ "From scholarship, sailors and sects to the mills and the mosques". The Guardian. 18 June 2002. Retrieved 22 February 2012. ^ "Islam and Britain". BBC. 2002. Retrieved 22 February 2012. ^ "Islam in the British Isles". islamfortoday.com. Archived from the original on 12 February 2012. Retrieved 22 February 2012. ^ "Did You Know?". Islam Can. Archived from the original on 19 September 2016. Retrieved 22 February 2012. ^ "Religion in Britain". diversiton.com. Archived from the original on 24 April 2015. Retrieved 21 September 2010. ^ "History of religion: Multicultural Wales". BBC. 15 June 2006. Retrieved 19 June 2010. ^ "World Heritage – United Kingdom of Great Britain and Northern Ireland". UNESCO World Heritage Convention website. UNESCO. 2010. Retrieved 9 September 2010. ^ a b c Snyder, Christopher Allen (2003). The Britons. Wiley-Blackwell. pp. 258–261. ISBN 978-0-631-22260-6. Retrieved 26 November 2010. ^ Ford, Patrick K (2008). The Mabinogi and Other Medieval Welsh Tales (2nd ed.). Berkeley and Los Angeles: University of California Press. p. 183. ISBN 978-0-520-25396-4. Retrieved 26 November 2010. ^ Koch, John Thomas (2006). Celtic culture: a historical encyclopedia. Santa Barbara: ABC-CLIO. pp. 359&nbsp, &&nbsp, 1324. ISBN 978-1-85109-440-0. Retrieved 26 November 2010. ^ White, Donna R (1998). A century of Welsh myth in children's literature. Westport, CT: Greenwood Publishing Group. p. 123. ISBN 978-0-313-30570-2. Retrieved 26 November 2010. ^ Koch, John Thomas (2006). Celtic culture: a historical encyclopedia. Santa Barbara: ABC-CLIO. pp. 925–927. ISBN 978-1-85109-440-0. Retrieved 26 November 2010. ^ Koch, John Thomas (2006). Celtic culture: a historical encyclopedia. Santa Barbara: ABC-CLIO. pp. 759–760. ISBN 978-1-85109-440-0. Retrieved 26 November 2010. ^ a b Williams, David (1961). A Short History of Modern Wales. London: John Murray. p. 121. ^ The Pocket Guide, p. 122. ^ Emyr Humphreys: Conversations and Reflections, ed. M. Wynn Thomas. University of Wales Press: Cardiff, 2002, p. 8. ^ "Celtic Art in Iron Age Wales, NMOW". Amgueddfa Cymru – National Museum Wales. Archived from the original on 13 January 2010. Retrieved 19 June 2010. ^ Moody, Theodore William; Cróinín, Dáibhí Ó; Martin, Francis X; Byrne, Francis John (2005). A New History of Ireland: Prehistoric and early Ireland. London: Oxford University Press. p. 540. ISBN 978-0-19-821737-4. Retrieved 21 November 2010. ^ Walsh, Alexander (1922). Scandinavian Relations with Ireland during the Viking Period. Dublin: Talbot Press. p. 20. ISBN 978-1-152-77368-4. Retrieved 21 November 2010. ^ "NMOW, Art in 18th Century Britain". Amgueddfa Cymru – National Museum Wales. Archived from the original on 25 January 2010. Retrieved 22 June 2010. ^ "NMOW, Welsh Artists of the 18th Century". Amgueddfa Cymru – National Museum Wales. Archived from the original on 25 January 2010. Retrieved 19 June 2010. ^ "Royal Cambrian Academy". Royal Cambrian Academy of Art. Archived from the original on 23 May 2011. Retrieved 19 June 2010. ^ "'I am the king of painters'". London: The Guardian. 16 November 2001. Retrieved 30 September 2010. ^ "Charles Davenport Lockwood 1877–1949". stamfordhistory.org. Retrieved 30 September 2010. ^ "The Kardomah". dylanthomas.com. City and County of Swansea Council. Archived from the original on 12 September 2007. Retrieved 5 October 2010. ^ Cooper, Emmanuel (28 January 2008). "Obituary-Susan Williams-Ellis". The Guardian website. London: The Guardian. Retrieved 29 November 2010. ^ a b "The dragon and war". BBC Cymru Wales website. BBC. 2010. Archived from the original on 28 January 2011. Retrieved 2 October 2010. ^ "Welsh flag, 23 February 1959 vol 600 cc121-2W". Hansard. Parliament of the United Kingdom. Retrieved 3 October 2010. ^ "Union Jack". Retrieved 2 May 2018. ^ "Red kite voted Wales' Favourite Bird". Royal Society for the Protection of Birds. ^ Burson, Sam (2 March 2007). "'Stop using my Three Feathers'". Western Mail. Cardiff: Media Wales Ltd. Retrieved 11 November 2010. ^ "Welsh National Anthem: History: About Wales". Visit Wales website. Welsh Government. 2010. Retrieved 21 October 2010. ^ "The anthem in more recent years". BBC Cymru Wales website. BBC. 1 December 2008. Retrieved 21 October 2010. ^ "Welsh anthem – The background to Hen Wlad Fy Nhadau". BBC Cymru Wales history website. BBC Cymru Wales. 1 December 2008. Retrieved 3 December 2010. ^ "NGB websites: About us: Sport Wales – Chwaraeon Cymru". Sport Wales website. Sport Wales. 2010. Archived from the original on 10 March 2012. Retrieved 29 November 2010. ^ "Questions facing Wales' regional plans". BBC Sport website. BBC. 3 April 2003. Retrieved 2 October 2010. ^ "WRU axe falls on Warriors". BBC Sport website. BBC. 1 June 2004. Retrieved 2 October 2010. ^ Evans, Alun. "A Brief History of the League". Welsh Premier League. Retrieved 23 November 2010. ^ "The Cardiff and Swansea Derby". BBC Cymru Wales website. BBC. 5 November 2010. Retrieved 23 November 2010. ^ "Gareth Bale: Ryan Giggs says winger can be Wales' greatest". BBC Sport. BBC. 13 October 2014. Retrieved 14 September 2015. ^ "What we do at the ECB". England and Wales Cricket Board. Retrieved 23 November 2010. ^ "History of Welsh county cricket". Glamorgan Cricket. Archived from the original on 28 March 2009. Retrieved 23 November 2010. ^ "Snooker". BBC Wales south east. BBC. Retrieved 23 November 2010. ^ "Colin Jackson, Record breaking 110m hurdler". BBC Wales south east. BBC. 2009. Retrieved 23 November 2010. ^ "Paralympian Tanni Grey-Thompson becomes people's peer". BBC News website. BBC. 29 March 2010. Retrieved 23 November 2010. ^ "Nicole Cooke Retires". Cardiff Ajax Cycling Club. 15 January 2013. Retrieved 16 February 2017. ^ "Geraint Thomas seals maiden Tour de France title with Paris procession". Guardian. 29 July 2018. Retrieved 31 July 2018. ^ "Joe Calzaghe, Wales's greatest ever boxer?". BBC Wales south east. BBC. Retrieved 23 November 2010. ^ Davies, Sean (25 March 2008). "Wales' boxing world champions". BBC Sport website. BBC. Retrieved 23 November 2010. ^ a b "How Wales became a magnet for major sports events". BBC Sport. BBC. 1 July 2015. Retrieved 14 September 2015. ^ "1958 British Empire and Commonwealth Games". Commonwealth Games Federation. Archived from the original on 14 April 2017. Retrieved 14 September 2015. ^ "Highlights: Juventus 1–4 Real Madrid". ITV plc. 3 June 2017. Retrieved 26 June 2017. ^ Turner, Helen (1 April 2010). "Celebration for UK's first digital country". WalesOnline website. Media Wales Ltd. Retrieved 25 November 2010. ^ a b c "About BBC Cymru Wales". BBC website. BBC. 2010. Retrieved 30 September 2010. ^ Globalisation and Its Impact on Wales. Welsh Affairs Select Committee, Second Report of Session 2008–09. House of Commons. 2009. p. 624. ISBN 978-0-215-52634-2. Retrieved 24 November 2010. ^ "Bafta TV award nominees announced". WalesOnline website. Media Wales Ltd. 18 March 2008. Retrieved 30 September 2010. ^ Globalisation and Its Impact on Wales. Welsh Affairs Select Committee, Second Report of Session 2008–09. House of Commons. 2009. p. 598. ISBN 978-0-215-52634-2. Retrieved 24 November 2010. ^ ap Dyfrig, Rhodri; Jones, George (2006). "The Welsh Language in the Media" (PDF). Mercator Institute for Media, Languages and Culture. Aberystwyth University. pp. 13–14. Archived from the original (PDF) on 11 June 2011. Retrieved 25 November 2010. ^ ap Dyfrig, Rhodri; Jones, George (2006). "The Welsh Language in the Media" (PDF). Mercator Institute for Media, Languages and Culture. Aberystwyth University. pp. 16–18. Archived from the original (PDF) on 11 June 2011. Retrieved 25 November 2010. ^ a b "Concern over newspapers' decline in Wales". BBC News website. BBC. 28 August 2010. Retrieved 25 November 2010. ^ a b c d ap Dyfrig, Rhodri; Jones, George (2006). "The Welsh Language in the Media" (PDF). Mercator Institute for Media, Languages and Culture. Aberystwyth University. pp. 22–23. Archived from the original (PDF) on 11 June 2011. Retrieved 25 November 2010. ^ Luft, Oliver (12 November 2010). "Wales on Sunday to unveil redesign this weekend". Press Gazette website. Press Gazette. Archived from the original on 16 June 2011. Retrieved 25 November 2010. ^ Jones, Alun Ffred AC/AM (4 March 2010). "Remit letter for the Welsh Books Council 2010–11" (PDF). Welsh Government. Archived from the original (PDF) on 22 February 2011. Retrieved 25 November 2010. ^ "What is the Welsh Books Council?". Welsh Books Council website. Welsh Books Council. 2009. Retrieved 25 November 2010. ^ a b ap Dyfrig, Rhodri; Jones, George (2006). "The Welsh Language in the Media" (PDF). Mercator Institute for Media, Languages and Culture. Aberystwyth University. p. 34. Archived from the original (PDF) on 11 June 2011. Retrieved 25 November 2010. ^ "Y Fasnach Lyfrau Ar-Lein – Welsh Book Trade Info". Welsh Books Council website. Welsh Books Council. 22 November 2010. Retrieved 25 November 2010. ^ "Phone fault hits Welsh magazine". BBC News website. BBC. 24 October 2005. Retrieved 25 November 2010. ^ "About". Poetry Wales website. Poetry Wales. 2010. Retrieved 25 November 2010. ^ "Planet: The International Magazine for Wales". Poetry Wales website. Poetry Wales. 2010. Archived from the original on 13 April 2010. Retrieved 25 November 2010. ^ Turner, Robin (3 November 2004). "laverbread". WalesOnline website. Media Wales Ltd. Retrieved 27 November 2010. ^ "Wales: Cultural life: Music, literature and film". Britannica (Online ed.). 2006. ^ "Welsh Folk Song Society". canugwerin.com. Retrieved 22 January 2015. ^ "Music Preview: National Youth Orchestra of Wales". WalesOnline website. Media Wales Ltd. 3 August 2010. Retrieved 26 September 2010. ^ a b Davies (2008), p. 532. ^ Price, Karen (22 January 2010). "Movers and shakers revitalising our arts – Cont". WalesOnline website. Media Wales Ltd. Retrieved 27 November 2010. ^ "Why so funny? – The top 10 Welsh comedians". WalesOnline website. Media Wales Ltd. 18 April 2012. Retrieved 14 February 2016. ^ "Caernarfon festival to have its last dance". BBC News website. BBC. 2 October 2010. Retrieved 2 October 2010. ^ "Clog maker hot-foots to new home". BBC News website. BBC. 28 December 2007. Retrieved 2 October 2010. ^ Smith, Mike (22 February 2013). "30th birthday celebrations for National Dance Company Wales". walesonline.co.uk. Retrieved 28 February 2013. ^ "The forgotten festivals of Wales". Amgueddfa Cymru – National Museum Wales website. Amgueddfa Cymru – National Museum Wales. 7 September 2007. Archived from the original on 22 January 2011. Retrieved 3 October 2010. ^ "St. Dwynwen's Day-Diwrnod Santes Dwynwen January 25th". Amgueddfa Cymru – National Museum Wales website. Amgueddfa Cymru – National Museum Wales. 6 May 2007. Retrieved 29 November 2010. Davies, John; Jenkins, Nigel; Baines, Menna; Lynch, Peredur I., eds. (2008). The Welsh Academy Encyclopaedia of Wales. Cardiff: University of Wales Press. ISBN 978-0-7083-1953-6.